When we look at the world around us, on Nature, we are impressed with its beauty and grandeur. Each thing we perceive, though it may be vanishingly small, is in itself a world, that is, like the whole of the universe, matter and force governed by law,—a world, the contemplation of which fills us with feelings of wonder and irresistibly urges us to ceaseless thought and inquiry. But in all this vast world, of all objects our senses reveal to us, the most marvelous, the most appealing to our imagination, appears no doubt a highly developed organism, a thinking being. If there is anything fitted to make us admire Nature's handiwork, it is certainly this inconceivable structure, which performs its innumerable motions of obedience to external influence. To understand its workings, to get a deeper insight into this Nature's masterpiece, has ever been for thinkers a fascinating aim, and after many centuries of arduous research men have arrived at a fair understanding of the functions of its organs and senses. Again, in all the perfect harmony of its parts, of the parts which constitute the material or tangible of our being, of all its organs and senses, the eye is the most wonderful. It is the most precious, the most indispensable of our perceptive or directive organs, it is the great gateway through which all knowledge enters the mind. Of all our organs, it is the one, which is in the most intimate relation with that which we call intellect. So intimate is this relation, that it is often said, the very soul shows itself in the eye. It can be taken as a fact, which the theory of the action of the eye implies, that for each external impression, that is, for each image produced upon the retina, the ends of the visual nerves, concerned in the conveyance of the impression to the mind, must be under a peculiar stress or in a vibratory state, It now does not seem improbable that, when by the power of thought an image is evoked, a distinct reflex action, no matter how weak, is exerted upon certain ends of the visual nerves, and therefore upon the retina. Will it ever be within human power to analyse the condition of the retina when disturbed by thought or reflex action, by the help of some optical or other means of such sensitiveness, that a clear idea of its state might be gained at any time? If this were possible, then the problem of reading one's thoughts with precision, like the characters of an open book, might be much easier to solve than many problems belonging to the domain of positive physical science, in the solution of which many, if not the majority: of scientific men implicitly believe. Helmholtz has shown that the fundi of the eye are themselves, luminous, and he was able to see, in total darkness, the movement of his arm by the light of his own eyes. This is one of the most remarkable experiments recorded in the history of science, and probably only a few men could satisfactorily repeat it, for it is very likely, that the luminosity of the eyes is associated with uncommon activity of the brain and great imaginative power. It is fluorescence of brain action, as it were. Another fact having a bearing on this subject which has probably been noted by many, since it is stated in popular expressions, but which I cannot recollect to have found chronicled as a positive result of observation is, that at times, when a sudden idea or image presents itself to the intellect, there is a distinct and sometimes painful sensation of luminosity produced in the eye, observable even in broad daylight. The saying then, that the soul shows itself in the eye, is deeply founded, and we feel that it expresses a great truth. It has a profound meaning even for one who, like a poet or artist, only following; his inborn instinct or love for Nature, finds delight in aimless thoughts and in the mere contemplation of natural phenomena, but a still more profound meaning for one who, in the spirit of positive scientific investigation, seeks to ascertain the causes of the effects. It is principally the natural philosopher, the physicist, for whom the eye is the subject of the most intense admiration. Two facts about the eye must forcibly impress the mind of the physicist, notwithstanding he may think or say that it is an imperfect optical instrument, forgetting, that the very conception of that which is perfect or seems so to him, has been gained through this same instrument. First, the eye is, as far as our positive knowledge goes, the only organ which is directly affected by that subtle medium, which as science teaches us, must fill all space; secondly, it is the most sensitive of our organs, incomparably more sensitive to external impressions than any other. The organ of hearing implies the impact of ponderable bodies, the organ of smell the transference of detached material particles, and the organs of taste. and of touch or force, the direct contact, or at least some interference of ponderable matter, and this is true even in those instances of animal organisms, in which some of these organs are developed to a degree of truly marvelous perfection. This being so, it seems wonderful that the organ of sight solely should be capable of being stirred by that, which all our other organs are powerless to detect, yet which plays an essential part in all natural phenomena, which transmits all energy and sustains all motion and, that most intricate of all, life, but which has properties such that even a scientifically trained mind cannot help drawing a distinction between it and all that is called matter. Considering merely this, and the fact that the eye, by its marvelous power, widens our otherwise very narrow range of perception far beyond the limits of the small world which is our own, to embrace myriads of other worlds, suns and stars in the infinite depths of the universe, would make it justifiable to assert, that it is an organ of a higher order. Its performances are beyond comprehension. Nature as far as we know never produced anything more wonderful. We can get barely a faint idea of its prodigious power by analyzing what it does and by comparing. When ether waves impinge upon the human body, they produce the sensations of warmth or cold, pleasure or pain, or perhaps other sensations of which we are not aware, and any degree or intensity of these sensations, which degrees are infinite in number, hence an infinite number of distinct sensations. But our sense of touch, or our sense of force, cannot reveal to us these differences in degree or intensity, unless they are very great. Now we can readily conceive how an organism, such as the human, in the eternal process of evolution, or more philosophically speaking, adaptation to Nature, being constrained to the use of only the sense of touch or force, for instance, might develop this sense to such a degree of sensitiveness or perfection, that it would be capable of distinguishing the minutest differences in the temperature of a body even at some distance, to a hundredth, or thousandth, or millionth part of a degree. Yet, even this apparently impossible performance would not begin to compare with that of the eye, which is capable of distinguishing and conveying to the mind in a single instant innumerable peculiarities of the body, be it in form, or color, or other respects. This power of the eye rests upon two thins, namely, the rectilinear propagation of the disturbance by which it is effected, and upon its sensitiveness. To say that the eye is sensitive is not saying anything. Compared with it, all other organs are monstrously crude. The organ of smell which guides a dog on the trail of a deer, the organ of touch or force which guides an insect in its wanderings, the organ of hearing, which is affected by the slightest disturbances of the air, are sensitive organs, to be sure, but what are they compared with the human eye! No doubt it responds to the faintest echoes or reverberations of the medium; no doubt, it brings us tidings from other worlds, infinitely remote, but in a language we cannot as yet always understand. And why not? Because we live in a medium filled with air and other gases, vapors and a dense mass of solid particles flying about. These play an important part in many phenomena; they fritter away the energy of the vibrations before they can reach the eye; they too, are the carriers of germs of destruction, they get into our lungs and other organs, clog up the channels and imperceptibly, yet inevitably, arrest the stream of life. Could we but do away with all ponderable matter in the line of sight of the telescope, it would reveal to us undreamt of marvels. Even the unaided eye, I think; would he capable of distinguishing in the pure medium, small objects at distances measured probably by hundreds or perhaps thousands of miles. But there is something else about the eye which impresses us still more than these wonderful features which we observed, viewing it from the standpoint of a physicist, merely as an optical instrument,—something which appeals to us more than its marvelous faculty of being directly affected by the vibrations of the medium, without interference of gross matter, and more than its inconceivable sensitiveness and discerning power. It is its significance in the processes of life. No matter what one's views on nature and life may be, he must stand amazed when, for the first time in his, thoughts, he realizes the importance of the eye in the physical processes and mental performances of the human organism. And how could it be otherwise, when he realizes, that the eye is the means through which the human race has acquired the entire knowledge it possesses, that it controls all our motions, more still, and our actions. There is no way of acquiring knowledge except through the eye. What is the foundation of all philosophical systems of ancient and modern times, in fact, of all the philosophy of men? I am I think; I think, therefore I am. But how could I think and how would I know that I exist, if I had not the eye? For knowledge involve. ; consciousness; consciousness involves ideas, conceptions; conceptions involve pictures or images, and images the sense of vision, and therefore the organ of sight. But how about blind men, will be asked? Yes, a blind man may depict in magnificent poems, forms and scenes from real life, from a world he physically does not see. A blind man may touch the keys of an instrument with unerring precision, may model the fastest boat, may discover and invent, calculate and construct, may do still greater wonders—but all the blind men who have done such thinks have descended from those who had seeing eyes. Nature may reach the same result in many ways. Like a wave in the physical world, in the infinite ocean of the medium which pervades all, so in the world of organism:, in life, an impulse started proceeds onward, at times, may be, with the speed of light, at times, again, so slowly that for ages and ages it seems to stay; passing through processes of a complexity inconceivable to men, but in ;ill its forms, in all its stages, its energy. ever and ever integrally present. A single ray of light from a distant star falling upon the eye of a tyrant in by-gone times, may have altered the course of his life, may have changed the destiny of nations, may have transformed the surface of the globe, so intricate, so inconceivably complex are the processes in Nature. In no way can we get such an overwhelming idea of the grandeur of Nature, as when we consider, that in accordance with the law of the conservation of energy, throughout the infinite, the forces are in a perfect balance, and hence the energy of a single thought may determine the motion of a Universe. It is not necessary that every individual, not even that every generation or many generations, should have the physical instrument of sight, in order to be able to form images and to think, that is, form ideas or conceptions; but sometime or other, during the process of evolution, the eye certainly must have existed, else thought, as we understand it, would be impossible; else conceptions, like spirit, intellect, mind, call it as you may, could not exist. It is conceivable, that in some other world, in some other beings, the eye is replaced by a different organ, equally or more perfect, but these beings cannot be men. Now what prompts us all to voluntary motions and actions of any kind? Again the eye. If I am conscious of the motion, I must have an idea or conception, that is, an image, therefore the eye. If I am not precisely conscious of the motion, it is, because the images are vague or indistinct, being blurred by the superimposition of many. But when I perform the motion, does the impulse which prompts me to the action come from within or from without? The greatest physicists have not disdained to endeavour to answer this and similar questions and have at tunes abandoned themselves to the delights of pure and unrestrained thought. Such questions are generally considered not to belong to the realm of positive physical science, but will before long be annexed to its domain. Helmholtz has probably thought more on life than any modern scientist. Lord Kelvin expressed his belief that life's process is electrical and that there is a force inherent to the organism and determining its motions. just as much as I am convinced of any physical truth I am convinced that the motive impulse must come from the outside. For, consider the lowest organism we know—and there are probably many lower ones—an aggregation of a few cells only. If it is capable of voluntary motion it can perform an infinite number of motions, all definite and precise. But now a mechanism consisting of a finite number of parts and few at that, cannot perform are infinite number of definite motions, hence the impulses which govern its movements must come from the environment. So, the atom, the ulterior element of the Universe's structure, is tossed about in space eternally, a play to external influences, like a boat in a troubled sea. Were it to stop its motion it would die: hatter at rest, if such a thin; could exist, would be matter dead. Death of matter! Never has a sentence of deeper philosophical meaning been uttered. This is the way in which Prof. Dewar forcibly expresses it in the description of his admirable experiments, in which liquid oxygen is handled as one handles water, and air at ordinary pressure is made to condense and even to solidify by the intense cold: Experiments, which serve to illustrate, in his language, the last feeble manifestations of life, the last quiverings of matter about to die. But human eyes shall not witness such death. There is no death of matter, for throughout the infinite universe, all has to move, to vibrate, that is, to live. I have made the preceding statements at the peril of treading upon metaphysical ground; in my desire to introduce the subject of this lecture in a manner not altogether uninteresting, I may hope, to an audience such as I have the honor to address. But now, then, returning to the subject, this divine organ of sight, this indispensable instrument for thought and all intellectual enjoyment, which lays open to us the marvels of this universe, through which we have acquired what knowledge we possess, and which prompts us to, and controls, all our physical and mental activity. By what is it affected? By light! What is light? We have witnessed the great strides which have been made in all departments of science in recent years. So great lave been the advances that we cannot refrain from asking ourselves, Is this all true; or is it but a dream? Centuries ago men have lived, have thought, discovered, invented, and have believed that they were soaring, while they were merely proceeding at a snail's pace. So we too may be mistaken. But taking the truth of the observed events as one of the implied facts of science, we must rejoice in the, immense progress already made and still more in the anticipation of what must come, judging from the possibilities opened up by modern research. There is, however, an advance which we have been witnessing, which must be particularly gratifying to every lover of progress. It is not a discovery, or an invention, or an achievement in any particular direction. It is an advance in all directions of scientific thought and experiment I mean the generalization of the natural forces and phenomena, the looming up of a certain broad idea on the scientific horizon. It is this idea which has, however, long ago taken possession of the most advanced minds, to which I desire to call your attention, and which I intend to illustrate in a general way, in these experiments, as the first step in answering the question "What is light?" and to realize the modern meaning of this word. It is beyond the scope of my lecture to dwell upon the subject of light in general, my object being merely to bring presently to your notice a certain class of light effects and a number of phenomena observed in pursuing the study of these effects. But to he consistent in my remarks it is necessary to state that, according to that idea, now, accepted by the majority of scientific men as a positive result of theoretical and experimental investigation, the various forms or manifestations of energy which were generally designated as "electric" or more precisely "electromagnetic" are energy manifestations of the same nature as those of radiant heat and light. Therefore the phenomena of light and heat and others besides these, may be called electrical phenomena. Thus electrical science has become the mother science of all and its study has become all important. The day when we shall know exactly what "electricity" is, will chronicle an event probably greater, more important than any other recorded in the history of the human race. The time will come when the comfort, the very existence, perhaps, or man will depend upon that wonderful agent. For our existence and comfort we require heat, light and mechanical power. How do we now get all these? We get them from fuel, we get them by consuming material. What will man do when the forests disappear, when the coal fields are exhausted? Only one thing according to our present knowledge will remain; that is, to transmit power at great distances. Men will go to the waterfalls, to the tides, which are the stores of an infinitesimal part of Nature's immeasurable energy. There will they harness the energy and transmit the same to their settlements, to warm their homes by, to give them light, and to keep their obedient slaves, the machines, toiling. But how will they transmit this energy if not by electricity? Judge then, if the comfort, nay, the very existence, of man will not depend on electricity. I am aware that this view is not that of a practical engineer, but neither is it that of an illusionist, for it is certain, that power transmission, which at present is merely a stimulus to enterprise, will some day be a dire necessity. It is more important for the student, who takes up the study of light phenomena, to make himself thoroughly acquainted with certain modern views, than to peruse entire books on the subject of light itself, as disconnected from these views. Were I therefore to make these demonstrations before students seeking information—and for the sake of the few of those who may be present, give me leave to so assume—it would be my principal endeavor to impress these views upon their minds in this series of experiments. It might be sufficient for this purpose to perform a simple and well-known experiment. I might take a familiar appliance, a Leyden jar, charge it from a frictional machine, and then discharge it. In explaining to you its permanent state when charged, and its transitory condition when discharging, calling your attention to the forces which enter into play and to the various phenomena they produce, and pointing out the relation of the forces and phenomena, I might fully succeed in illustrating that modern idea. No doubt, to the thinker, this simple experiment would appeal as much as the most magnificent display. But this is to be an experimental demonstration, and one which should possess, besides instructive, also entertaining features and as such, a simple experiment, such as the one cited, would not go very far towards the attainment of the lecturer's aim. I must therefore choose another way of illustrating, more spectacular certainly, but perhaps also more instructive. Instead of the frictional machine and Leyden jar, I shall avail myself in these experiments of an induction coil of peculiar properties, which was described in detail by me in a lecture before the London Institution of Electrical Engineers, in Feb., 1892. This induction coil is capable of yielding currents of enormous potential differences, alternating with extreme rapidity. With this apparatus I shall endeavor to show you three distinct classes of effects, or phenomena, and it is my desire that each experiment, while serving for the purposes of illustration, should at the same time teach us some novel truth, or show us some novel aspect of this fascinating science. But before doing this, it seems proper and useful to dwell upon the apparatus employed, and method of obtaining the high potentials and high-frequency currents which are made use of in these experiments. These high-frequency currents are obtained in a peculiar manner. The method employed was advanced by me about two years ago in an experimental lecture before the American Institute of Electrical Engineers. A number of ways, as practiced in the laboratory, of obtaining these currents either from continuous or low frequency alternating currents, is diagrammatically indicated in Fig. 1/165, which will be later described in detail. The general plan is to charge condensers, from a direct or alternate-current source, preferably of high-tension, and to discharge them disruptively while observing well-known conditions necessary to maintain the oscillations of the current. In view of the general interest taken in high-frequency currents and effects producible by them, it seems to me advisable to dwell at some length upon this method of conversion. In order to give you a clear idea of the action, I will suppose that a continuous-current generator is employed, which is often very convenient. It is desirable that the generator should possess such high tension as to be able to break through a small air space. If this is not the case, then auxiliary means have to be resorted to, some of which will be indicated subsequently. When the condensers are charged to a certain potential, the air, or insulating space, gives way and a disruptive discharge: occurs. There is then a sudden rush of current and generally a large portion of accumulated electrical energy spends itself. The condensers are thereupon quickly charged and the same process is repeated in more or less rapid succession. To produce such sudden rushes of current it is necessary to observe certain conditions. If the rate at which the condensers are discharged is the same as that at which they are charged, then, clearly, in the assumed case the condensers do not come into play. If the rate of discharge be smaller than the rate of charging, then, again, the condensers cannot play an important part. But if, on the contrary, the rate of discharging is greater than that of charging, then a succession of rushes of current is obtained. It is evident that, if the rate at which the energy is dissipated by the discharge is very much greater than the rate of supply to the condensers, the sudden rushes will be comparatively few, with long-time intervals between. This always occurs when a condenser of considerable capacity is charged by means of a comparatively small machine. If the rates of supply and dissipation are not widely different, then the rushes of current will be in quicker succession, and this the more, the more nearly equal both the rates are, until limitations incident to each case and depending upon a number of causes are reached. Thus we are able to obtain from a continuous-current generator as rapid a succession of discharges as we like. Of course, the higher the tension of the generator, the smaller need be the capacity of the condensers, and for this reason, principally, it is of advantage to employ a generator of very high tension. Besides, such a generator permits the attaining of greater rates of vibration. The rushes of current may be of the same direction under the conditions before assumed, but most generally there is an oscillation superimposed upon the fundamental vibration of the current. When the conditions are so determined that there are no oscillations, the current impulses are unidirectional and thus a means is provided of transforming a continuous current of high tension, into a direct current of lower tension, which I think may find employment in the arts. This method of conversion is exceedingly interesting and I was much impressed by its beauty when I first conceived it. It is ideal in certain respects. It involves the employment of no mechanical devices of any kind, and it allows of obtaining currents of any desired frequency from an ordinary circuit, direct or alternating. The frequency of the fundamental discharges depending on the relative rates of supply and dissipation can be readily varied within wide limits, by simple adjustments of these quantities, and the frequency of the superimposed vibration by the determination of the capacity, self-induction and resistance of the circuit. The potential of the currents, again, may be raised as high as any insulation is capable of withstanding safely by combining capacity and self-induction or by induction in a secondary, which need have but comparatively few turns. As the conditions are often such that the intermittence or oscillation does not readily establish itself, especially when a direct current source is employed, it is of advantage to associate an interrupter with the arc, as I have, some time ago, indicated the use of an air-blast or magnet, or other such device readily at hind. The magnet is employed with special advantage in the conversion of direct currents, as it is then very effective. If the primary source is an alternate current generator. it is desirable, as I have stated on another occasion, that the frequency should be low, and that tile current forming the arc be large, in order to render the magnet more effective. A form of such discharger with a magnet which has been found convenient, and adopted after some trials, in the conversion of direct currents particularly, is illustrated in Fig. 2/166. N S are the pole pieces of a very strong magnet which is excited by a coil c. The pole pieces are slotted for adjustment and can be fastened in any position by screws s sl. The discharge rods d d1, thinned down on the ends in order to allow a closer approach of the magnetic pole pieces, pass through the columns of brass b b1 and are fastened in position by screws s2 s2. Springs r r1 and collars c c1 are slipped on the rods, the latter serving to set the points of the rods at a certain suitable distance by means of screws s3 s3 and the former to draw the points apart. When it is desired to start the arc, one of the large rubber handles h h1 is tapped quickly with the hand, whereby the points of the rods are brought in contact but are instantly separated by the springs r r1. Such an arrangement has been found to be often necessary, namely in cases when the E. M. F. was not large enough to cause the discharge to break through the gap, and also when it was desirable to avoid short circuiting of the generator by the metallic contact of the rods. The rapidity of the interruptions of the current with a magnet depends on the intensity of the magnetic field and on the potential difference at the end of the arc. The interruptions are generally in such quick succession as to produce a musical sound. Years ago it was observed that when a powerful induction coil is discharged between the poles of a strong magnet, the discharge produces a loud noise not unlike a small pistol shot. It was vaguely stated that the spark was intensified by the presence of the magnetic field. It is now clear that the discharge current, flowing for some time, was interrupted a great number of times by the magnet, thus producing the sound. The phenomenon is especially marked when the field circuit of a large magnet or dynamo is broken in a powerful magnetic field. When the current through the gap is comparatively large, it is of advantage to slip on the points of the discharge rods pieces of very hard carbon and let the arc play between the carbon pieces. This preserves the rods, and besides has the advantage of keeping the air space hotter, as the heat is not conducted away as quickly through the carbons, and the result is that a smaller E. M. F. in the arc gap is required to maintain a succession of discharges. Another form of discharger, which may be employed with advantage in some cases, is illustrated in Fig. 3/167. In this form the discharge rods d d1 pass through perforations in a wooden box B, which is thickly coated with mica on the inside, as indicated by the heavy lines. The perforations are provided with mica tubes m m1 of some thickness, which are preferably not in contact with the rods d d1. The box has a cover c which is a little larger and descends on the outside of the box. The spark gap is warmed by a small lamp l contained in the box. A plate p above the lamp allows the draught to pass only through the chimney a of the lamp, the air entering through holes o o in or near the bottom of the box and following the path indicated by the arrows. When the discharger is in operation, the door of the box is closed so that the light of the arc is not visible outside. It is desirable to exclude the light as perfectly as possible, as it interferes with some experiments. This form of discharger is simple and very effective when properly manipulated. The air being warmed to a certain temperature, has its insulating power impaired; it becomes dielectrically weak, as it were, and the consequence is that the arc can be established at much greater distance. The arc should, of course, be sufficiently insulating to allow the discharge to pass through the gap disruptively. The arc formed under such conditions, when long, may be made extremely sensitive, and the weal: draught through the lamp chimney a is quite sufficient to produce rapid interruptions. The adjustment is made by regulating the temperature and velocity of the draught. Instead of using the lamp, it answers the purpose to provide for a draught of warm air in other ways. A very simple way which has been practiced is to enclose the arc in a long vertical tube, with plates on the top and bottom for regulating the temperature and velocity of the air current. Some provision had to be made for deadening the sound. The air may be rendered dielectrically weak also by rarefaction. Dischargers of this kind have likewise been used by me in connection with a magnet. A large tube is for this purpose provided with heavy electrodes of carbon or metal, between which the discharge is made to pass, the tube being placed in a powerful magnetic field The exhaustion of the tube is carried to a point at which the discharge breaks through easily, but the pressure should be more than 75 millimetres, at which the ordinary thread discharge occurs. In another form of discharger, combining the features before mentioned, the discharge was made to pass between two adjustable magnetic pole pieces, the space between them being kept at an elevated temperature. It should be remarked here that when such, or interrupting devices of any kind, are used and the currents are passed through the primary of a disruptive discharge coil, it is not, as a rule, of advantage to produce a number of interruptions of the current per second greater than the natural frequency of vibration of the dynamo supply circuit, which is ordinarily small. It should also be pointed out here, that while the devices mentioned in connection with the disruptive discharge are advantageous under certain conditions, they may be sometimes a source of trouble, as they produce intermittences and other irregularities in the vibration which it would be very desirable to overcome. There is, I regret to say, in this beautiful method of conversion a defect, which fortunately is not vital, .and which I have been gradually overcoming. I will best call attention to this defect and indicate a fruitful line of work, by comparing the electrical process with its mechanical analogue. The process may be illustrated in this manner. Imagine a tank; with a wide opening at the bottom, which is kept closed by spring pressure, but so that it snaps off sudden/y when the liquid in the tank has reached a certain height. Let the fluid be supplied to the tank by means of a pipe feeding at a certain rate. When the critical height of the liquid is reached, the spring gives way and the bottom of the tank drops out. Instantly the liquid falls through the wide opening, and the spring, reasserting itself, closes the bottom again. The tank is now filled, and after a certain time interval the same process is repeated. It is clear, that if the pipe feeds the fluid quicker than the bottom outlet is capable of letting it pass through, the bottom will remain off and the tank; will still overflow. If the rates of supply are exactly equal, then the bottom lid will remain partially open and no vibration of the same and of the liquid column will generally occur, though it might, if started by some means. But if the inlet pipe does not feed the fluid fast enough for the outlet, then there will be always vibration. Again, in such case, each time the bottom flaps up or down, the spring and the liquid column, if the pliability of the spring and the inertia of the moving parts are properly chosen, will perform independent vibrations. In this analogue the fluid may be likened to electricity or electrical energy, the tank to the condenser, the spring to the dielectric, and the pipe to the conductor through which electricity is supplied to the condenser. To make this analogy quite complete it is necessary to make the assumption, that the bottom, each time it gives way, is knocked violently against a non-elastic stop, this irnpact involving some loss of energy; and that, besides, some dissipation of energy results due to frictional losses. In the preceding analogue the liquid is supposed to be under a steady pressure. If the presence of the fluid be assumed to vary rhythmically, this may be taken as corresponding to the case of an alternating current. The process is then not quite as simple to consider, but the action is the same in principle. It is desirable, in order to maintain the vibration economically, to reduce the impact and frictional losses as much as possible. As regards the latter, which in the electrical analogue correspond to the losses due to the resistance of the circuits, it is impossible to obviate them entirely, but they can be reduced to a minimum by a proper selection of the dimensions of the circuits and by the employment of thin conductors in the form of strands. But the loss of energy caused by the first breaking through of the dielectric—which in the above example corresponds to the violent knock of the bottom against the inelastic stop—would be more important to overcome. At the moment of the breaking through, the air space has a very high resistance, which is probably reduced to a very small value when the current has reached some strength, and the space is brought to a high temperature. It would materially diminish the loss of energy if the space were always kept at an extremely high temperature, but then there would be no disruptive break. By warming the space moderately by means of a lamp or otherwise, the economy as far as the arc is concerned is sensibly increased. But the magnet or other interrupting device does not diminish the loss in the arc. Likewise, a jet of air only facilitates the carrying off of the energy. Air, or a gas in general, behaves curiously in this respect. When two bodies charged to a very high potential, discharge disruptively through an air space, any amount of energy may be carried off by the air. This energy is evidently dissipated by bodily carriers, in impact and collisional losses of the molecules. The exchange of the molecules in the space occurs with inconceivable rapidity. A powerful discharge taking place between two electrodes, they may remain entirely cool, and yet the loss in the air may represent any amount of energy. It is perfectly practicable, with very great potential differences in the gap, to dissipate several horse-power in the arc of the discharge without even noticing a small increase in the temperature of the electrodes. All the frictional losses occur then practically in the air. If the exchange of the air molecules is prevented, as by enclosing the air hermetically, the bas inside of the vessel is brought quickly to a high temperature, even with a very small discharge. It is difficult to estimate how much of the energy is lost in sound waves, audible or not, in a powerful discharge. When the currents through the gap are large, the electrodes may become rapidly heated, but this is not a reliable measure of the energy wasted in the arc, as the loss through the yap itself may be comparatively small. The air or a gas in general is at ordinary pressure at least, clearly not the best medium through which a disruptive discharge should occur. Air or other gas under great pressure is of curse a much more suitable medium for the discharge gap. I have carried on long-continued experiments in this direction, unfortunately less practicable on account of the difficulties and expense in getting air under great pressure. But even if the medium in the discharge space is solid or liquid, still the same losses take place, though they are generally smaller, for just as soon as the arc is established, the solid or liquid is volatilized. Indeed, !here is no body known which would not be disintegrated by the arc, and it is an open question among scientific men, whether an arc discharge could occur at all in the air itself without the particles of the electrodes being torn off. When the current through the gap is very small and the arc very long, I believe that a relatively considerable amount of heat is taken up in the disintegration of the electrodes, which partially on this account may remain quite cold. The ideal medium for a discharge gap should only crack. and the ideal electrode should be of some material which cannot be disintegrated. With small currents through the gap it is best to employ aluminum, but not when the currents are large. The disruptive break in the air, or more or less in any ordinary medium, is not of the nature of a crack, but it is rather comparable to the piercing of innumerable bullets through a mass offering great frictional resistances to the motion of the bullets, this involving considerable loss of energy. A medium which would merely crack when strained electrostatically—and this possibly might be the case with a perfect vacuum, that is, pure ether—would involve a very small loss in the gap, so small as to be entirely negligible, at least theoretically, because a crack may be produced by an infinitely small displacement. In exhausting an oblong bulb provided with two aluminum terminals, with the greatest care, I have succeeded in producing such a vacuum that the secondary discharge of a disruptive discharge coil would break disruptively through the bulb in the form of fine spark streams. The curious point was that the discharge would completely ignore the terminals and start far behind the two aluminum plates which served as electrodes. This extraordinary high vacuum could only be maintained for a very short while. To return to the ideal medium; think, for the sake of illustration, of a piece of glass or similar body clamped in a vice, and the latter tightened more and more. At a certain point a minute increase of the pressure will cause the ;glass to crack. The loss of energy involved in splitting the glass may be practically nothing, for though the force is great, the displacement need be but extremely small. Now imagine that the glass would possess the property of closing again perfectly the crack upon a minute diminution of the pressure. This is the way the dielectric in the discharge space should behave. But inasmuch as there would be always some loss in the gap, the medium, which should be continuous should exchange through the gap at a rapid rate. In the preceding example, the glass being perfectly closed, it would mean that the dielectric in the discharge space possesses a great insulating power; the glass being cracked, it would signify that the medium in the space is a good conductor. The dielectric should vary enormously in resistance by minute variations of the E. M. F. across the discharge space. This condition is attained, but in an extremely imperfect manner, by warming the air space to a. certain critical temperature, dependent on the E. M. F. across the gap, or by otherwise impairing the insulating power of the air. But as a matter of fact the air does never break down disruptively, if this term be rigorously interpreted, for before the sudden rush of the current occurs, there is always a weak current preceding it, which rises first gradually and then with comparative suddenness. That is the reason why the rate of change is very much greater when glass, for instance, is broken through, than when the break takes place through an air space of equivalent dielectric strength. As a medium for the discharge space, a solid, or even a liquid, would be preferable therefore. It is somewhat difficult to conceive of a solid body which would possess the property of closing instantly after it has been cracked. But a liquid, especially under great pressure, behaves practically like a solid, while it possesses the property of closing the crack. Hence it was thought that a liquid insulator might be more suitable as a dielectric than air. Following out this idea, a number of different forms of dischargers in which a variety of such insulators, sometimes under great pressure, were employed, have been experimented upon. It is thought sufficient to dwell in a few words upon one of the forms experimented upon. One of these dischargers is illustrated in Figs. 4a/168a and 4b/168b. A hollow metal pulley P (Fig. 4a/168a), was fastened upon an arbor a, which by suitable means was rotated at a considerable speed. On the inside of the pulley, but disconnected from the same, was supported a thin disc h (which is shown thick for the sake of clearness), of hard rubber in which there were embedded two metal segments s s with metallic extensions e e into which were screwed conducting terminals t t covered with thick tubes of hard rubber t t. The rubber disc b with its metallic segments s s, was finished in a lathe, and its entire surface highly polished so as to offer the smallest possible frictional resistance to the motion through a fluid. In the hollow of the pulley an insulating liquid such as a thin oil was poured so as to reach very nearly to the opening left in the flange f, which was screwed tightly on the front side of the pulley. The terminals t t, were connected to the opposite coatings of a battery of condensers so that the discharge occurred through the liquid. When the pulley was rotated, the liquid was forced against the rim of the pulley and considerable fluid pressure resulted. In this simple way the discharge gap was filled with a medium which behaved practically like a solid, which possessed the duality of closing instantly upon the occurrence of the break, and which moreover was circulating through the gap at a rapid rate. Very powerful effects were produced by discharges of this kind with liquid interrupters, of which a number of different forms were made. It was found that, as expected, a longer spark for a given length of wire was obtainable in this way than by using air as an interrupting device. Generally the speed, and therefore also the fluid pressure, was limited by reason of the fluid friction, in the form of discharger described, but the practically obtainable speed was more than sufficient to produce a number of breaks suitable for the circuits ordinarily used. In such instances the metal pulley P was provided with a few projections inwardly, and a definite number of breaks was then produced which could be computed from the speed of rotation of the pulley. Experiments were also carried on with liquids of different insulating power with the view of reducing the loss in the arc. When an insulating liquid is moderately warmed, the loss in the arc is diminished. A point of some importance was noted in experiments with various discharges of this kind. It was found, for instance, that whereas the conditions maintained in these forms were favorable for the production of a great spark length, the current so obtained was not best suited to the production of light effects. Experience undoubtedly has shown, that for such purposes a harmonic rise and fall of the potential is preferable. Be it that a solid is rendered incandescent, or phosphorescent, or be it that energy is transmitted by condenser coating through the glass, it is quite certain that a harmonically rising and falling potential produces less destructive action, and that the vacuum is more permanently maintained. This would be easily explained if it were ascertained that the process going on in an exhausted vessel is of an electrolytic nature. In the diagrammatical sketch, Fig. 1/165, which has been already referred to, the cases which are most likely to be met with in practice are illustrated. One has at his disposal either direct or alternating currents from a supply station. It is convenient for an experimenter in an isolated laboratory to employ a machine G, such as illustrated, capable of giving both kinds of currents. In such case it is also preferable to use a machine with multiple circuits, as in many experiments it is useful and convenient to have at one's disposal currents of different phases. In the sketch, D represents the direct and A the alternating circuit. In each of these, three branch circuits are shown, all of which are provided with double line switches s s s s s s. Consider first the direct current conversion; la represents the simplest case. If the E. M. F. of the generator is sufficient to break through a small air space, at least when the latter is warmed or otherwise rendered poorly insulating, there is no difficulty in maintaining a vibration with fair economy by judicious adjustment of the capacity, self-induction and resistance of the circuit L. containing the devices l l m. The magnet N, S, can be in this case advantageously combined with the air space, The discharger d d with the magnet may be placed either way, as indicated by the full or by the dotted lines. The circuit la with the connections and devices is supposed to possess dimensions such as are suitable for the maintenance of a vibration. But usually the E. M. F. on the circuit or branch la will be something like a 100 volts or so, and in this case it is not sufficient to break through the gap. Many different means may be used to remedy this by raising the E. M. F. across the gap. The simplest is probably to insert a large self-induction coil in series with the circuit L. When the arc is established, as by the discharger illustrated in Fig. 2/166, the magnet blows the arc out the instant it is formed. Now the extra current of the break, being of high E. M. F., breaks through the gap, and a path of low resistance for the dynamo current being again provided, there is a sudden rush of current from the dynamo upon the weakening or subsidence of the extra current. This process is repeated in rapid succession, and in this manner I have maintained oscillation with as low as 50 volts, or even less, across the gap. But conversion on this plan is not to be recommended on account of the too heavy currents through the gap and consequent heating of the electrodes; besides, the frequencies obtained in this way are low, owing to the high self-induction necessarily associated with the circuit. It is very desirable to have the E. M. F. as high as possible, first, in order to increase the economy of the conversion, and secondly, to obtain high frequencies. The difference of potential in this electric oscillation is, of course, the equivalent of the stretching force in the mechanical vibration of the spring. To obtain very rapid vibration in a circuit of some inertia, a great stretching force or difference of potential is necessary. Incidentally, when the E. M. F. is very great, the condenser which is usually employed in connection with the circuit need but have a small capacity, and many other advantages are gained. With a view of raising the E. M. F. to a many times greater value than obtainable from ordinary distribution circuits, a rotating transformer g is used, as indicated at IIa, Fig. 1, or else a separate high potential machine is driven by means of a motor operated from the generator G. The latter plan is in fact preferable, as changes are easier made. The connections from the high tension winding are quite similar to those in branch la with the exception that a condenser C, which should be adjustable, is connected to the high tension circuit. Usually, also, an adjustable self-induction coil in series with the circuit has been employed in these experiments. When the tension of the currents is very high, the magnet ordinarily used in connection with the discharger is of comparatively small value, as it is quite easy to adjust the dimensions of the circuit so that oscillation is maintained. The employment of a steady E. M. F. in the high frequency conversion affords some advantages over the employment of alternating E. M. F., as the adjustments are much simpler and the action can be easier controlled. But unfortunately one is limited by the obtainable potential difference. The winding also breaks down easily in consequence of the sparks which form between the sections of the armature or commutator when a vigorous oscillation takes place. Besides, these transformers are expensive to build. It has been found by experience that it is best to follow the plan illustrated at Met, In this arrangement a rotating transformer g, is employed to convert the low tension direct currents into low frequency alternating currents, preferably also of small tension. The tension of the currents is then raised in a stationary transformer T. The secondary s of this transformer is connected to an adjustable condenser C which discharges through the gap or discharger d d, placed in either of the ways indicated, through the primary P of a disruptive discharge coil, the high frequency current being obtained from the secondary s of this coil, as described on previous occasions. This will undoubtedly be found the cheapest and most convenient way of converting direct currents. The three branches of the circuit A represent the usual cases met in practice when alternating currents are converted. In Fig. 1/165, Ib a condenser C, generally of large capacity, is connected to the circuit L containing the devices l l, m m. The devices m m are supposed to be of high self-induction so as to bring the frequency of the circuit more or less to that of the dynamo. In this instance the discharger d d should best have a number of makes and breaks per second equal to twice the frequency of the dynamo. If not so, then it should have at least a number equal to a multiple or even fraction of the dynamo frequency. It should be observed, referring to Ib, that the conversion to a high potential is also effected when the discharger d d, which is shown in the sketch, is omitted. But the effects which are produced by currents which rise instantly to high values, as in a disruptive discharge, are entirely different from those produced by dynamo currents which rise and fall harmonically. So, for instance, there might be in a given case a number of makes and breaks at d d equal to just twice the frequency of the dynamo, or in other words, there may be the same number of fundamental oscillations as would be produced without the discharge gap, and there might even not be any quicker superimposed vibration; yet the differences of potential at the various points of the circuit, the impedance and other phenomena, dependent upon the rate of change, will bear no similarity in the two cases. Thus, when working with currents discharging disruptively, the element chiefly to be considered is not the frequency, as a student might be apt to believe, but the rate of change per unit of time. With low frequencies in a certain measure the same effects may be obtained as with high frequencies, provided the rate of change is sufficiently great. So if a low frequency current is raised to a potential of, say, 75,000 volts, and the high tension current passed through a series of high resistance lamp filaments, the importance of the rarefied gas surrounding the filament is clearly noted, as will be seen later; or, if a low frequency current of several thousand amperes is passed through a metal bar, striking phenomena of impedance are observed, just as with currents of high frequencies. But it is, of course, evident that with low frequency currents it is impossible to obtain such rates of change per unit of time as with high frequencies, hence the effects produced by the latter are much more prominent. It is deemed advisable to make the preceding remarks, inasmuch as many more recently described effects have been unwittingly identified with high frequencies. Frequency alone in reality does not mean anything, except when an undisturbed harmonic oscillation is considered. In the branch IIIb a similar disposition to that in Ib is illustrated, with the difference that the currents discharging through the gap d d are used to induce currents in the secondary s of a transformer T. In such case the secondary should be provided with an adjustable condenser for the purpose of tuning it to the primary. IIb illustrates a plan of alternate current high frequency conversion which is most frequently used and which is found to be most convenient. This plan has been dwelt upon in detail on previous occasions and need not be described here. Some of these results were obtained by the use of a high frequency alternator. A description of such machines will be found in my original paper before the American Institute of Electrical Engineers, and in periodicals of that period, notably in The Electrical Engineer of March 18, 1891. I will now proceed with the experiments. The first class of effects I intend to show you are effects produced by electrostatic force. It is the force which governs the motion of the atoms, which causes them to collide and develop the life-sustaining energy of heat and light, and which causes them to aggregate in an infinite variety of ways, according to Nature's fanciful designs, and to form all these wondrous structures we perceive around us; it is, in fact, if our present views be true, the most important force for us to consider in. Nature. As the term electrostatic might imply a steady electric condition, it should be remarked, that in these experiments the force is not constant, but varies at a rate which may be considered moderate, about one million times a second, or thereabouts. This enables me to produce many effects which are not producible with an unvarying force. When two conducting bodies are insulated and electrified, we say that an electrostatic force is acting between them. This force manifests itself in attractions, repulsions and stresses in the bodies and space or medium without. So great may be the strain exerted in the air, or whatever separates the two conducting bodies, that it may break down, and we observe sparks or bundles of light or streamers, as they are called. These streamers form abundantly when the force through the air is rapidly varying. I will illustrate this action of electrostatic force in a novel experiment in which I will employ the induction coil before referred to. The coil is contained in a trough filled with oil, and placed under the table. The two ends of .the secondary wire pass through the two thick columns of hard rubber which protrude to solve height above the table. It is necessary to insulate the ends or terminals of the secondary heavily with hard rubber, because even dry wood is by far ton poor an insulator for these currents of enormous potential differences. On one of the terminals of the coil, I ,have placed a large sphere of sheet brass, which is connected to a larger insulated brass plate, in order to enable me to perform the experiments under conditions, which, as you will see, are more suitable for this experiment. I now set the coil to work and approach the free terminal with a metallic object held in my hand, this simply to avoid burns As I approach the metallic object to a distance of eight or tell inches, a torrent of furious sparks breaks forth from the end of the secondary wire, which passes through the rubber column. The sparks cease when the metal in my hand touches the wire. My arm is now traversed by a powerful electric current, vibrating at about the rate of one million times a second. All around me the electrostatic force makes itself felt, and the air molecules and particles of dust flying about are acted upon and are hammering violently against my body. So great is this agitation of the particles, that when the lights are turned out you may see streams of feeble light appear on some parts of my body. When such a streamer breaks out on any part of the body, it produces a sensation like the pricking of a needle. Were the potentials sufficiently high and the frequency of the vibration rather low, the skin would probably be ruptured under the tremendous strain, and the blood would rush out with great force in the form of fine spray or jet so thin as to be invisible, just as oil will when placed on the positive terminal of a Holtz machine. The breaking through of the skin though it may seem impossible at first, would perhaps occur, by reason of the tissues finder the skin being incomparably better conducting. This, at least, appears plausible, judging from some observations. I can make these streams of light visible to all, by touching with the metallic object one of the terminals as before, and approaching my free hand to the brass sphere, which is connected to the second terminal of the coil. As the hand is approached, the air between it and the sphere, or in the immediate neighborhood, is more violently agitated, and you see streams of light now break forth from my finger tips and from the whole hand (Fig. 5/169). Were I to approach the hand closer, powerful sparks would jump from the brass sphere to my hand, which might be injurious. The streamers offer no particular inconvenience, except that in the ends of the finger tips a burning sensation is felt. They should not be confounded with those produced by an influence machine, because in many respects they behave differently. I have attached the brass sphere and plate to one of the terminals in order to prevent the formation of visible streamers on that terminal, also in order to prevent sparks from jumping at a considerable distance. Besides, the attachment is favorable for the working of the coil. The streams of light which you have observed issuing from my hand are due to a potential of about 200,000 volts, alternating in rather irregular intervals, sometimes like a million times a second. A vibration of the same amplitude, but four times as fast, to maintain which over 3,000,000 volts would be required, would be mare than sufficient to envelop my body in a complete sheet of flame. But this flame would not burn me up; quite contrarily, the probability is ,that I would not be injured in the least. Yet a hundredth part of that energy, otherwise directed; would be amply sufficient to kill a person. The amount of energy which may thus be passed into the body of a person depends on the frequency and potential of the currents, and by making both of these very great, a vast amount of energy may be passed into the body without causing any discomfort, except perhaps, in the arm, which is traversed by a true conduction current. The reason why no pain in the body is felt, and no injurious effect noted, is that everywhere, if a current be imagined to flow through the body, the direction of its flow would be at right angles to the surface; hence the body of the experimenter offers an enormous section to the current, and the density is very small, with the exception of the arm, perhaps, where the density may be considerable. Lout if only a small fraction of that energy would be applied in such a way that a current would traverse the body in the same manner as a low frequency current, a shock would be received which might be fatal. A direct or low frequency alternating current is fatal, I think, principally because its distribution through the body is not uniform, as it must divide itself in minute streamlets of great density, whereby some organs are vitally injured. That such a process occurs I have not the least doubt, though no evidence might apparently exist, or be found upon examination. The surest to injure and destroy life, is a continuous current, but the most painful is an alternating current of very low frequency. The expression of these views, which are the result of long continued experiment and observation, both with steady and varying currents, is elicited by the interest which is at present taken in this subject, and by the manifestly erroneous ideas which are daily propounded in journals on this subject. I may illustrate an effect of the electrostatic force by another striking experiment, but before, I must call your attention to one or two facts. I have said before, that whet; the medium between two oppositely electrified bodies is strained beyond a certain limit it gives way and, stated in popular language, the opposite electric charges unite and neutralize each other. This breaking down of the medium occurs principally when the force acting between the bodies is steady, or varies at a moderate rate. Were the variation sufficiently rapid, such a destructive break would not occur, no matter how great the force, for all the energy would be spent in radiation, convection and mechanical and chemical action. Thus the spark length, or greatest distance which a spark will jump between the electrified bodies is the smaller, the greater the variation or time rate of change. But this rule may be taken to be true only in a general way, when comparing rates which are widely different. I will show you by an experiment the difference in the effect produced by a rapidly varying and a steady or moderately varying force. I have here two large circular brass plates p p (Fig. 6a and Fig. 6b), supported on movable insulating stands on the table, connected to the ends of the secondary of a coil similar to the one used before. I place the plates ten or twelve inches apart and set the coil to work. You see the whole space between the plates, nearly two cubic feet, filled with uniform light, Fig. 6a. This light is due to the streamers you have seen in the first experiment, which are now much more intense. I have already pointed out the importance of these streamers in commercial apparatus and their still greater importance in some purely scientific investigations, Often they are to weak to be visible, but they always exist, consuming energy and modifying the action of .the apparatus. When intense, as they are at present, they produce ozone in great quantity, and also, as Professor Crookes has pointed out, nitrous acid. So quick is the chemical action that if a coil, such as this one, is worked for a very long time it will make the atmosphere of a small room unbearable, for the eyes and throat are attacked. But when moderately produced, the streamers refresh the atmosphere wonderfully, like a thunder-storm, and exercises unquestionably a beneficial effect. In this experiment the force acting between the plates changes in intensity and direction at a very rapid rate. I will now make the rate of change per unit time much smaller. This I effect by rendering the discharges through the primary of the induction coil less frequent, and also by diminishing the rapidity of the vibration in the secondary. The former result is conveniently secured by lowering the E. M. F. over the air gap in the primary circuit, the latter by approaching the two brass plates to a distance of about three or four inches. When the coil is set to work, you see no streamers or light between the plates, yet the medium between them is under a tremendous strain. I still further augment the strain by raising the E. M. F. in the primary circuit, and soon you see the air give away and the hall is illuminated by a shower of brilliant and noisy sparks, Fig. 6b. These sparks could be produced also with unvarying force; they have been for many years a familiar phenomenon, though they were usually obtained from an entirely different apparatus. In describing these two phenomena so radically different in appearance, I have advisedly spoken of a "force" acting between the plates. It would be in accordance with the accepted views to say, that there was an "alternating E. M. F.", acting between the plates. This term is quite proper and applicable in all cases where there is evidence of at least a possibility of an essential inter-dependence of the electric state of the plates, or electric action in their neighborhood. But if the plates were removed to an infinite distance, or if at a finite distance, there is no probability or necessity whatever for such dependence. I prefer to use the term "electrostatic force," and to say that such a force is acting around each plate or electrified insulated body in general. There is an inconvenience in usin this expression as the term incidentally, means a steady electric condition; but a proper nomenclature will eventually settle this difficulty. I now return to the experiment to which I have already alluded, and with which I desire to illustrate a striking effect produced by a rapidly varying electrostatic force. I attach to the end of the wire, l (Fig. 7), which is in connection with one of the terminals of the secondary of the induction coil, an exhausted bulb b. This bulb contains a thin carbon filament f, which is fastened to a platinum wire w, sealed in the glass and leading outside of the bulb, where it connects to the wire l. The bulb may be exhausted to any degree attainable with ordinary apparatus. Just a moment before, you have witnessed the breaking down of the air between the charged brass plates. You know that a plate of glass, or any other insulating material, would break down in like manner. Had I therefore a metallic coating attached to the outside of the bulb, or placed near the same, and were this coating connected to the other terminal of the coil, would be prepared to see the glass give way if the strain were sufficiently increased. Even were the coating not connected to the other terminal, but to an insulated plate, still, if you have followed recent developments, you would naturally expect a rapture of the glass. But it will certainly surprise you to note that under the action of the varying electrostatic force, the glass gives way when all other bodies are removed from the bulb. In fact, all the surrounding bodies we perceive might be removed to an infinite distance without affecting the result in the slightest. When the coil is set to work, the glass is invariably broken through at the seal, or other narrow channel, and the vacuum is quickly impaired. Such a damaging break would not occur with a steady force, even if the same were many times greater. The break is due to the agitation of the molecules of the gas within the bulb, and outside of the same. This agitation, which is generally most violent in the narrow pointed channel near the seal, causes a heating and rupture of the glass. This rupture would, however, not occur, not even with a varying force, if the medium filling the inside of the bulb, and that surrounding it, were perfectly homogeneous. The break occurs much quicker if the top of the bulb is drawn out into a fine fibre. In bulbs used with these coils such narrow, pointed channels must therefore be avoided. When a conducting body is immersed in air, or similar insulating medium, consisting of, or containing, small freely movable particles capable of being electrified, and when the electrification of the body is made to undergo a very rapid change—which is equivalent to saying that the electrostatic force acting around the body is varying in intensity,—the small particles are attracted and repelled, and their violent impacts against the body may cause a mechanical motion of the latter. Phenomena of this kind are noteworthy, inasmuch as they have not been observed before with apparatus such as has been commonly in use. If a very light conducting sphere be suspended oil an exceedingly fine wire, and charged to a steady potential, however high, the sphere will remain at rest. Even if the potential would be rapidly varying, provided that the small particles of matter, molecules or atoms, are evenly distributed, no motion of the sphere should result. But if one side of the conducting sphere is covered with a thick insulating layer, the impacts of the particles will cause the sphere to move about, generally in irregular curves, Fig. 8a. In like manner, as I have shown on a previous occasion, a fan of sheet metal, Fig. 8b, covered partially with insulating material as indicated, and placed upon the terminal of the coil so as to turn freely on it, is spun around. All these phenomena you have witnessed and others which will be shown later, are due to the presence of a medium like air, and would not occur in a continuous medium. The action of the air may be illustrated still better by the following experiment. I take a glass tube t, Fig. 9, of about an inch in diameter, which has a platinum wire w sealed in the lower end, and to which is attached a thin lamp filament f. I connect the wire with the terminal of the coil and set the coil to work. The platinum wire is now electrified positively and negatively in rapid succession and the wire and air inside of the tube is rapidly heated by the impacts of the particles, which may be so violent as to render the filament incandescent. But if I pour oil in the tube, just as soon as the wire is covered with the oil, all action apparently ceases and there is no marked evidence of heating. The reason of this is that the oil is a practically continuous medium. The displacements in such a continuous medium are, with these frequencies, to all appearance incomparably smaller than in air, hence the work performed in such a medium is insignificant. But oil would behave very differently with frequencies many times as great, for even though the displacements be small, if the frequency were much greater, considerable work might be performed in the oil. The electrostatic attractions and repulsions between bodies of measurable dimensions are, of all the manifestations of this force, the first so-called electrical phenomena noted. But though they have been known to us for many centuries, the precise nature of the mechanism concerned in these actions is still unknown to us, and has not been even quite satisfactorily explained. What kind of mechanism must that be? We cannot help wondering when we observe two magnets attracting and repelling each other with a force of hundreds of pounds with apparently nothing between them. We have in our commercial dynamos magnets capable of sustaining in mid-air tons of weight. But what are even these forces acting between magnets when compared with the tremendous attractions and repulsions produced by electrostatic force, to which there is apparently no limit as to intensity. In lightning discharges bodies are often charged to so high a potential that they are thrown away with inconceivable force and torn asunder or shattered into fragments. Still even such effects cannot compare with the attractions and repulsions which exist between charged molecules or atoms, and which are sufficient to project them with speeds of many kilometres a second, so that under their violent impact bodies are rendered highly incandescent and are volatilized. It is of special interest for the thinker who inquires into the nature of these forces to note that whereas the actions between individual molecules or atoms occur seemingly under any conditions, the attractions and repulsions of bodies of measurable dimensions imply a medium possessing insulating properties. So, if air; either by being rarefied or heated, is rendered more or less conducting, these actions between two electrified bodies practically cease, while the actions between the individual atoms continue to manifest themselves. An experiment may serve as an illustration and as a means of bringing out other features of interest: Some time ago I showed that a lamp filament or wire mounted in a bulb and connected to one of the terminals of a high tension secondary coil is set spinning, the top of the filament generally describing a circle. This vibration was very energetic when the air in the bulb was at ordinary pressure and became less energetic when the air in the bulb was strongly compressed. It ceased altogether when the air was exhausted so as to become comparatively good conducting. I found at that time that no vibration tool: place when the bulb was very highly exhausted. But I conjectured that the vibration which I ascribed to the electrostatic action between the walls of the bulb and the filament should take place also in a highly exhausted bulb. To test this under conditions which were more favorable, a bulb like the one in Fig. 10; was constructed. It comprised a globe b, in the neck of which was sealed a platinum wire w, carrying a thin lamp filament f. In the lower part of the globe a tube t was sealed so as to surround the filament. The exhaustion was carried as far as it was practicable with the apparatus employed. This bulb verified my expectation, for the filament was set spinning when the current was turned on, and became incandescent. It also showed another interesting feature, bearing upon the preceding remarks, namely, when the filament had been kept incandescent some time, the narrow tube and the space inside were brought to an elevated temperature, and as the gas in the tube then became conducting, the electrostatic attraction between the glass and the filament became very weak or ceased, and the filament came to rest, When it came to rest it would glow far more intensely. This was probably due to its assuming the position in the centre of the tube where the molecular bombardment was most intense, and also partly to the fact that the individual impacts were more violent and that no part of the supplied energy was converted into mechanical movement. Since, in accordance with accepted views, in this experiment the incandescence must be attributed to the impacts of the particles, molecules or atoms in tire heated space, these particles must therefore, in order to explain such action, be assumed to behave as independent carriers of electric charges immersed in an insulating medium; yet there is no attractive force between the glass tube and the filament because the space in the tube is, as a whole, conducting. It is of some interest to observe in this connection that whereas the attraction between two electrified bodies may cease owing to the impairing of the insulating power of the medium in which they are immersed, the repulsion between the bodies may still be observed. This may be explained in a plausible way. When the bodies are placed at some distance in a poorly conducting medium, such as slightly warmed or rarefied air, and are suddenly electrified, opposite electric charges being imparted to them, these charges equalize more or less by leakage through the air. But if the bodies are similarly electrified, there is less opportunity afforded for such dissipation, hence the repulsion observed in such case is greater than the attraction. Repulsive actions in a gaseous medium are however, as Prof. Crookes has shown, enhanced by molecular bombardment. So far, I have considered principally effects produced by a varying electrostatic force in an insulating medium, such as air. When such a force is acting upon a conducting body of measurable dimensions, it causes within the same, or on its surface, displacements of the electricity, and gives rise to electric currents, and these produce another kind of phenomena, some of which I shall presently endeavor to illustrate. In presenting this second class of electrical effects, I will avail myself principally of such as are producible without any return circuit, hoping to interest you the more by presenting these phenomena in a more or less novel aspect. It has been a long time customary, owing to .the limited experience with vibratory currents, to consider an electric current as something circulating in a closed conducting path. It was astonishing at first to realize that a current may flow through tile conducting path even if the latter be interrupted; and it was still more surprising to learn, that sometimes it may be even easier to make a current flow under such conditions than through a closed path. But that old idea is gradually disappearing, even among practical men, and will soon be entirely forgotten. If I connect an insulated metal plate P, Fig. 11/175, to one of the terminals T of the induction coil by means of a wire, though this plate be verv well insulated, a current passes through the wire when the coil is set to work. First I wish to give you evidence that there is a current passing through the connecting wire. An obvious way of demonstrating this is to insert between the terminal of the coil and the insulated plate a very thin platinum or german silver wire w and bring the latter to incandescence or fusion by the current. This requires a rather large plate or else current impulses of very high potential and frequency. Another way is to take a coil C, Fig. 11/175, containing many turns of thin insulated wire and to insert the same in the path of the current to the plate. When I connect one of the ends of the coil to the wire leading to another insulated plate P1, and its other end to the terminal T1 of the induction coil, and set the latter to work, a current passes through the inserted coil C and the existence of the current may be made manifest in various ways. For instance, I insert an iron core i within the coil. The current being one of very high frequency, will, if it be of some strength, soon bring the iron core to a noticeably higher temperature, as the hysteresis and current losses are great with such high frequencies. One might take a core of smale size, laminated or not, it would matter little; but ordinary iron wire 1/16th or 1/8th of an inch thick is suitable for the purpose. While the induction coil is working, a current traverses the inserted coil and only a few moments are sufficient to bring the iron wire i to an elevated temperature sufficient to soften the sealing wax s and cause a paper washer p fastened by it to the iron wire to fall off. But with the apparatus such as I have here, other, much more interesting, demonstrations of this kind can be made. I have a secondary s, Fig;. 12/176, of coarse wire, wound upon a coil similar to the first. In the preceding experiment the current through the coil C, Fig. 11/175, was very small, but there being many turns a strong heating effect was, nevertheless, produced in the iron wire. Had I passed that current through a conductor in order to show the heating of the latter, the current might have been too small to produce the effect desired. But with this coil provided with a secondary winding, I can now transform the feeble current of high tension which passes through the primary P into a strong secondary current of low tension, and this current will quite certainly do what I expect. In a small glass tube (t, Fig. 12/176), I have enclosed a coiled platinum wire, w, this merely in order to protect the wire. On each end of the glass tube is sealed a terminal of stout wire to which one of the ends of the platinum wire w, is connected. I join the terminals of the secondary coil to these terminals and insert the primary p, between the insulated plate P1, and the terminal T1, of the induction coil as before. The latter being set to work, instantly the platinum wire w is rendered incandescent and can be fused, even if it be very thick. Instead of the platinum wire I now take an ordinary 50-volt 16 c p. lamp. When I set the induction coil in operation the lamp filament is brought to high incandescence. It is, however, not necessary to use the insulated plate, for the lamp (l Fig. 13) is rendered incandescent even if the plate P1 be disconnected. The secondary may also he connected to the primary as indicated by the dotted line in Fig. 13, to do away more or less with the electrostatic induction or to modify the action otherwise. I may here call attention to a number of interesting observations with the lamp. First, I disconnect one of the terminals of the lamp from the secondary s. When the induction coil plays, a glow is noted which fills the whole bulb. This glow is due to electrostatic induction. It increases when the bulb is grasped with the hand, and the capacity of the experimenter's body thus added to the secondary circuit. The secondary, in effect, is equivalent to a metallic coating, which would be placed near the primary. If the secondary, or its equivalent, the coating, were placed symmetrically to the primary, the electrostatic induction would be nil under ordinary conditions, that is, when a primary return circuit is used, as both halves would neutralize each other. The secondary is in fact placed symmetrically to the primary, but the action of both halves of the latter, when only one of its ends is connected to the induction coil, is not exactly equal; hence electrostatic induction takes place, and hence the glow in the bulb. I can nearly equalize the action of both halves of the primary by connecting the other, free end of the same to the insulated plate, as in the preceding experiment. When the plate is connected, the glow disappears. With a smaller plate it would not entirely disappear and then it would contribute to the brightness of the filament when the secondary is closed, by warming the air in the bulb. To demonstrate another interesting feature, I have adjusted the coils used in a certain way. I first connect both the terminals of the lamp to the secondary, one end of the primary being connected to the terminal T1 of the induction coil and the other to tae insulated plate P, as before. When the current is turned on, the lamp glows brightly, as shown in Fig. 14b, in which C is a fine wire coil and s a coarse wire secondary wound upon it. If the insulated plate P1 is disconnected, leaving one of the ends a of the primary insulated, the filament becomes dark or generally it diminishes in brightness (Fig. 14a). Connecting again the plate P1 and raising the frequency of the current, I make the filament quite dark or barely red (Fig. 15b). Once more I will disconnect the plate. One will of course infer that when the plate is disconnected, the current through the primary will be weakened, that therefore the E. M. F. will fall in the secondary .s and that the brightness of the lamp will diminish. This might be the case and the result can be secured by an easy adjustment of the coils; also by varying the frequency and potential of the currents. But it is perhaps of greater interest to note, that the lamp increases in brightness when the plate is disconnected (Fig; 15a). In this case all the energy the primary receives is now sunk info it, like the charge of a battery in an ocean cable, but most of that energy is recovered through the secondary and used to light the lamp. The current traversing the primary is strongest at the end b which is connected to the terminal T, of the induction coil, and diminishes in strength towards the remote end a. But the dynamic inductive effect exerted upon the secondary s is now greater than before, when the suspended plate was connected to the primary. These results might have been produced by a number of causes. For instance, the plate P1 being connected, the reaction from the coil C may be such as to diminish the potential at the terminal T1 of the induction coil, and therefore weaken the current through the primary of the coil C. Or the disconnecting of the plate may diminish the capacity effect with relation to the primary of the latter coil to such an extent that the current through it is diminished, though the potential at the terminal T1 of the induction coil may be the same or even higher. Or the result might have been produced by the change of please of the primary and secondary currents and consequent reaction. But the chief determining factor is the relation of the self-induction and capacity of coil C and plate P1 and the frequency of the currents. The greater brightness of the filament in Fig. 15a. is, however, in part due to the heating of the rarefied gas in the lamp by electrostatic induction; which, as before remarked, is greater when the suspended plate is disconnected. Still another feature of some interest I tray here bring to your attention. When the insulated date is disconnected and the secondary of the coil opened, by approaching. a small object to the secondary, but very small sparks can be drawn from it, showing that the electrostatic induction is small in this case. But upon the secondary being closed upon itself or through the lamp, the filament, glowing brightly, strong sparks are obtained from the secondary. The electrostatic induction is now much greater, because the closed secondary determines a greater flow of current through the primary and principally through that half of it which is connected to the induction coil. If now the bulb be grasped with the hand, the capacity of the secondary with reference to the primary is augmented by the experimenter's body and the luminosity of the filament is increased, the Incandescence now being due partly to the flow of current through the filament and partly to the molecular bombardment of the rarefied gas in the bulb. The preceding experiments will have prepared one for the next following results of interest, obtained in the course of these investigations. Since I can pass a current through an insulated wire merely by connecting one of its ends to the source of electrical energy, since I can induce by it another current, magnetize all iron core, and, in short, perform all operations as though a return circuit were used, clearly I can also drive a motor by the aid of only one wire. On a former occasion I have described a simple form of motor comprising a single exciting coil, an iron core and disc. Fig. 16 illustrates a modified way of operating such an alternate current motor by currents induced in a transformer connected to one lead, and several other arrangements of circuits for operating a certain class of alternating motors founded on the action of currents of differing phase. In view of the present state of the art it is thought sufficient to describe these arrangements in a few words only. The diagram, Fig. 16 II., shows a primary coil P, connected with one of its ends to the line L leading from a high tension transformer terminal T1. In inductive relation to this primary P is a secondary s of coarse wire in the circuit of which is a coil C. The currents induced in the secondary energize the iron core i, which is preferably, but not necessarily, subdivided, and set the metal disc d in rotation. Such a motor M2 as diagrammatically shown in Fig. 16 II., has been called a "magnetic lag motor", but this expression may be objected to by those who attribute the rotation of the disc to eddy currents circulating in minute paths when the core i is finally subdivided. In order to operate such a motor effectively on the plan indicated, the frequencies should not he too high, not more than four or five thousand, though the rotation is produced even with ten thousand per second, or more. In Fig. 16 I., a motor M1 having two energizing circuits, A and B, is diagrammatically indicated. The circuit A is connected to the line L and in series with it is a primary P, which may have its free end connected to an insulated plate P1, such connection being indicated by the dotted lines. The other motor circuit B is connected to the secondary s which is in inductive relation to the primary P. When the transformer terminal T1 is alternately electrified, currents traverse the open line L and also circuit A and primary P. The currents through the latter induce secondary currents in the circuit S, which pass through the energizing coil B of the motor. The currents through the secondary S and those through the primary P differ in phase 90 degrees, or nearly so, and are capable of rotating an armature placed in inductive relation to the circuits A and B. In Fig. 16 III., a similar motor M 3 with two energizing circuits A1 and B1 is illustrated. A primary P, connected with one of its ends to the line L has a secondary S, which is preferably wound for a tolerably high E. M. F., and to which the two energizing circuits of the motor are connected, one directly to the ends of the secondary and the other through a condenser C, by the action of which the currents traversing the circuit A1 and B1 are made to differ in phase. In Fig. 16 IV., still another arrangement is shown. In this case two primaries P1 and P2 are connected to the line L, one through a condenser C of small capacity, and the other directly. The primaries are provided with secondaries S1 and S2 which are in series with the energizing circuits, A2 and B2 and a motor M3 the condenser C again serving to produce the requisite difference in the phase of the currents traversing the motor circuits. As such phase motors with two or more circuits are now well known in the art, they have been here illustrated diagrammatically. No difficulty whatever is found in operating a motor in the manner indicated, or in similar ways; and although such experiments up to this day present only scientific interest, they may at a period not far distant, be carried out with practical objects in view. It is thought useful to devote here a few remarks to the subject of operating devices of all kinds by means of only one leading wire. It is quite obvious, that when high-frequency currents are made use of, ground connections are—at least when the E. M. F. of the currents is great—better than a return wire. Such ground connections are objectionable with steady or low frequency currents on account of destructive chemical actions of the former and disturbing influences exerted by both on the neighboring circuits; but with high frequencies these actions practically do not exist. Still, even ground connections become, superfluous when the E. M. F. is very high, for soon a condition is reached, when the current may be passed more economically through open, than through closed, conductors. Remote as might seem an industrial application of such single wire transmission of energy to one not experienced in such lines of experiment, it will not seem so to anyone who for some time has carried on investigations of such nature. Indeed I cannot see why such a plan, should not be practicable. Nor should it be thought that for carrying out such a plan currents of very high frequency are expressly required, for just as soon as potentials of say 30,000 volts are used, the single wire transmission may be effected with low frequencies, and experiments have been made by me from which these inferences are trade. When the frequencies are very high it has been found in laboratory practice quite easy to regulate the effects in the manner shown in diagram Fig. 17. Here two primaries P and P1 are shown, each connected with one of its ends to the line L and with the other end to the condenser plates C and C, respectively. Near these are placed other condenser plates C1 and C1, the former being connected to the line L and the latter to an insulated larger plate P2. On the primaries are wound secondaries S and S1, of coarse wire, connected to the devices d and l respectively. By varying the distances of the condenser plates C and C1, and C and C1 the currents through the secondaries S and S1 are varied in intensity. The curious feature is the great sensitiveness, the slightest change in the distance of the plates producing considerable variations in the intensity or strength of the currents. The sensitiveness may be rendered extreme by making the frequency such, that the primary itself, without any plate attached to its free end, satisfies, in conjunction with the closed secondary, the condition of resonance. In such condition an extremely small change in the capacity of the free terminal produces great variations. For instance, I have been able to adjust the conditions so that the mere approach of a person to the coil produces a considerable change in the brightness of the lamps attached to the secondary. Such observations and experiments possess, of course, at present, chiefly scientific interest, but they may soon become of practical importance. Very high frequencies are of course not practicable with motors on account of the necessity of employing iron cores. But one may use sudden discharges of low frequency and thus obtain certain advantages of high-frequency currents without rendering the iron core entirely incapable of following the changes and without entailing a very great expenditure of energy in the core. I have found it quite practicable to operate with such low frequency disruptive discharges of condensers, alternating-current motors. A certain class of such motors which I advanced a few years ago, which contain closed secondary circuits, will rotate quite vigorously when the discharges are directed through the exciting coils. One reason that such a motor operates so well with these discharges is that the difference of phase between the primary and secondary currents is 90 degrees, which is generally not the case with harmonically rising and falling currents of low frequency. It might not be without interest to show an experiment with a simple motor of this kind, inasmuch as it is commonly thought that disruptive discharges are unsuitable for such purposes. The motor is illustrated in Fig. 18/182. It comprises a rather large iron core i with slots on the top into which are embedded thick copper washers c c. In proximity to the core is a freely-movable metal disc D. The core is provided with a primary exciting coil C1 the ends a and b of which are connected to the terminals of the secondary S of an ordinary transformer, the primary P of the latter being connected to an alternating distribution circuit or generator G of low or moderate frequency. The terminals of the secondary S are attached to a condenser C which discharges through an air gap d d which may be placed in series or shunt to the coil C1. When the conditions are properly chosen the disc D rotates with considerable effort and the iron core i does not get very perceptibly hot. With currents from a high-frequency alternator, on the contrary, the core gets rapidly hot and the disc rotates with a much smaller effort. To perform the experiment properly it should be first ascertained that the disc D is not set in rotation when the discharge is not occurring at d d. It is preferable to use a large iron core and a condenser of large capacity so as to bring the superimposed quicker oscillation to a very low pitch or to do away with it entirely. By observing certain elementary rules I have also found it practicable to operate ordinary series or shunt direct-current motors with such disruptive discharges, and this can be done with or without a return wire. Among the various current phenomena observed, perhaps the most interesting are those of impedance presented by conductors to currents varying at a rapid rate. In my first paper before the American Institute of Electrical Engineers, I have described a few striking observations of this kind. Thus I showed that when such currents or sudden discharges are passed through a thick metal bar there may be points on the bar only a few inches apart, which have a sufficient potential difference between them to maintain at bright incandescence an ordinary filament lamp. I have also described the curious behavior of rarefied gas surrounding a conductor, due to such sudden rushes of current. These phenomena have since been more carefully studied and one or two novel experiments of this kind are deemed of sufficient interest to be described here. Referring to Fig. 19a/183a, B and B1 are very stout copper bars connected at their lower ends to plates C and C1, respectively, of a condenser, the opposite plates of the latter being connected to the terminals of the secondary S of a high-tension transformer, the primary P of which is supplied with alternating currents from an ordinary low-frequency dynamo G or distribution circuit. The condenser discharges through an adjustable gap d d as usual. By establishing a rapid vibration it was found quite easy to perform the following curious experiment. The bars B and B1 were joined at the top by a low-voltage lamp l3 a little lower was placed by means of clamps C C, a 50-volt lamp l2; and still lower another 100-volt lamp l1; and finally, at a certain distance below the latter lamp, an exhausted tube T. By carefully determining the positions of these devices it was found practicable to maintain them all at their proper illuminating power. Yet they were all connected in multiple arc to the two stout copper bars and required widely different pressures. This experiment requires of course some time for adjustment but is quite easily performed. In Figs. 19b/183b and 19c/183c, two other experiments are illustrated which, unlike the previous experiment, do not require very careful adjustments. In Fig. 19b/183b, two lamps, l1 and l2, the former a 100-volt and the latter a 50-volt are placed in certain positions as indicated, the 100-volt lamp being below the 50-volt lamp. When the arc is playing at d d and the sudden discharges are passed through the bars B B1, the 50-volt lamp will, as a rule, burn brightly, or at least this result is easily secured, while the 100-volt lamp will burn very low or remain quite dark, Fig. 19b/183b. Now the bars B B1 may be joined at the top by a thick cross bar B2 and it is quite easy to maintain the 100-volt lamp at full candle-power while the 50-volt lamp remains dark, Fig. 19c/183c. These results, as I have pointed out previously, should not be considered to be due exactly to frequency but rather to the time rate of change which may be great, even with low frequencies. A great many other results of the same kind, equally interesting, especially to those who are only used to manipulate steady currents, may be obtained and they afford precious clues in investigating the nature of electric currents. In the preceding experiments I have already had occasion to show some light phenomena and it would now be proper to study these in particular; but to make this investigation more complete I think it necessary to make first a few remarks on the subject of electrical resonance which has to be always observed in carrying out these experiments. The effects of resonance are being more and more noted by engineers and are becoming of great importance in the practical operation of apparatus of all kinds with alternating currents. A few general remarks may therefore be made concerning these effects. It is clear, that if we succeed in employing the effects of resonance practically in the operation of electric devices the return wire will, as a matter of course, become unnecessary, for the electric vibration may be conveyed with one wire just as well as, and sometimes even better than, with two. The question first to answer is, then, whether pure resonance effects are producible. Theory and experiment both show that such is impossible in Nature, for as the oscillation becomes more and more vigorous, the losses in the vibrating bodies and environing media rapidly increase and necessarily check the vibration which otherwise would go on increasing forever. It is a fortunate circumstance that pure resonance is not producible, for if it were there is no telling what dangers might not lie in wait for the innocent experimenter. But to a certain degree resonance is producible, the magnitude of the effects being limited by the imperfect conductivity and imperfect elasticity of the media or, generally stated, by frictional losses. The smaller these losses, the more striking are the effects. The same is the case in mechanical vibration. A stout steel bar may be set in vibration by drops of water falling, upon it at proper intervals; and with glass, which is more perfectly elastic, the resonance effect is still more remarkable, for a goblet may be burst by singing into it a tone of the proper pitch. The electrical resonance is the more perfectly attained, the smaller the resistance or the impedance of the conducting path and the more perfect the dielectric. In a Leyden jar discharging through a short stranded cable of thin wires these requirements are probably best fulfilled, and the resonance effects are , therefore very prominent. Such is not the case with dynamo machines, transformers and their circuits, or with commercial apparatus in general in which the presence of iron cores complicates the action or renders it impossible. In regard to Leyden jars with which resonance effects are frequently demonstrated, I would say that the effects observed are often attributed but are seldom due to true resonance, for an error is quite easily made in this respect. This may be undoubtedly demonstrated by the following experiment. Take, for instance, two large insulated metallic plates or spheres which I shall designate A and B; place them at a certain small distance apart and charge them from a frictional or influence machine to a potential so high that just a slight increase of the difference of potential between them will cause the small air or insulating space to break down. This is easily reached by making a few preliminary trials. If now another plate—fastened on an insulating handle and connected by a wire to one of the terminals of a high tension secondary of an induction coil, which is maintained in action by an alternator (preferably high frequency)—is approached to one of the charged bodies A or B, so a s to be nearer to either one of them, the discharge will invariably occur between them; at least it will, if the potential of the coil in connection with the plate is sufficiently high. But the explanation of this will soon be found in the fact that the approached plate acts inductively upon the bodies A and B and causes a spark to pass between them. When this spark occurs, the charges which were previously imparted to these bodies from the influence machine, must needs be lost, since the bodies are brought in electrical connection through the arc formed. Now this arc is formed whether there be resonance or not. But even if the spark would not be produced, still there is an alternating E. M. F. set up between the bodies when the plate is brought near one of them; therefore the approach of the plate, if it does not always actually, will, at any rate, tend to break down the air space by inductive action. Instead of the spheres or plates A and B we may take the coatings of a Leyden jar with the same result, and in place of the machine,—which is a high frequency alternator preferably, because it is more suitable for the experiment and also for the argument,—we may take another Leyden jar or battery of jars. When such jars are discharging through a circuit of low resistance the same is traversed by currents of very high frequency. The plate may now be connected to one of the coatings of the second jar, and when it is brought near to the first jar just previously charged to a high potential from an influence machine, the result is the same as before, and the first jar will discharge through a small air space upon the second being caused to discharge. But both jars and their circuits need not be tuned any closer than a basso profundo is to the note produced by a mosquito, as small sparks will be produced through the air space, or at least the latter will be considerably more strained owing to the setting up of an alternating E. M. F. by induction, which takes place when one of the jars begins to discharge. Again another error of a similar nature is quite easily made. If the circuits of the two jars are run parallel and close together, and the experiment has been performed of discharging one by the other, and now a coil of wire be added to one of the circuits whereupon the experiment does not succeed, the conclusion that this is due to the fact that the circuits are now not tuned, would be far from being safe. For the two circuits act as condenser coatings and the addition of the coil to one of them is equivalent to bridging them, at the point where the coil is placed, by a small condenser, and the effect of the latter might be to prevent the spark from jumping through the discharge space by diminishing the alternating E. M. F. acting across the same. All these remarks, and many more which might be added but for fear of wandering too far from the subject, are made with the pardonable intention of cautioning the unsuspecting student, who might gain an entirely unwarranted opinion of his skill at seeing every experiment succeed; but they are in no way thrust upon the experienced as novel observations. In order to make reliable observations of electric resonance effects it is very desirable, if not necessary, to employ an alternator giving currents which rise and fall harmonically, as in working with make and break currents the observations are not always trustworthy, since many phenomena, which depend on the rate of change, may be produced with widely different frequencies. Even when making such observations with an alternator one is apt to be mistaken. When a circuit is connected to an alternator there are an indefinite number of values for capacity and self-induction which, in conjunction, will satisfy the condition of resonance. So there are in mechanics an infinite number of tuning forks which will respond to a note of a certain pitch, or loaded springs which have a definite period of vibration. But the resonance will be most perfectly attained in that case in which the motion is effected with the greatest freedom. Now in mechanics, considering the vibration in the common medium—that is, air—it is of comparatively little importance whether one tuning fork be somewhat larger than another, because the losses in the air are not very considerable. One may, of course, enclose a tuning fork in an exhausted vessel and by thus reducing the air resistance to a minimum obtain better resonant action. Still the difference would not be very great. But it would make a great difference if the tuning fork were immersed in mercury. In the electrical vibration it is of enormous importance to arrange the conditions so that the vibration is effected with the greatest freedom. The magnitude of the resonance effect depends, under otherwise equal conditions, on the quantity of electricity set in motion or on the strength of the current driven through the circuit. But the circuit opposes the passage of .the currents by reason of its impedance and therefore, to secure the best action it is necessary to reduce the impedance to a minimum. It is impossible to overcome it entirely, but merely in part, for the ohmic resistance cannot be overcome. But when the frequency of the impulses is very great, the flow of the current is practically determined by self-induction. Now self-induction can be overcome by combining it with capacity. If the relation between these is such, that at the frequency used they annul each other, that is, have such values as to satisfy the condition of resonance, and the greatest quantity of electricity is made to flow through the external circuit, then the best result is obtained. It is simpler and safer to join the condenser in series with the self-induction. It is clear that in such combinations there will be, for a given frequency, and considering only the fundamental vibration, values which will give the best result, with the condenser in shunt to the self-induction coil; of course more such values than with the condenser in series. But practical conditions determine the selection. In the latter case in performing the experiments one may take a small self-induction and a large capacity or a small capacity and a large self-induction, but the latter is preferable, because it is inconvenient to adjust a large capacity by small steps. By taking a coil with a very large self-induction the critical capacity is reduced to a very small value, and the capacity of the coil itself may be sufficient. It is easy, especially by observing certain artifices, to wind a coil through which the impedance will be reduced to the value of the ohmic resistance only; and for any coil there is, of course, a frequency at which the maximum current will be made to pass through the coil. The observation of the relation between self-induction, capacity and frequency is becoming important in the operation of alternate current apparatus, such as transformers or motors, because by a judicious determination of the elements the employment of an expensive condenser becomes unnecessary. Thus it is possible to pass through the coils of an alternating current motor under the normal working conditions the required current with a low E. M. F. and do away entirely with the false current, and the larger the motor, the easier such a plan becomes practicable; but it is necessary for this to employ currents of very high potential or high frequency. In Fig. 20 I / 184 I. is shown a plan which has been followed in the study of the resonance effects by means of a high frequency alternator. C1 is a coil of many turns, which is divided into small separate sections for the purpose of adjustment. The final adjustment was made sometimes with a few thin iron wires (though this is not always advisable) or with a closed secondary. The coil C1 is connected with one of its ends to the line L from the alternator G and with the other end to one of the plates C of a condenser C C1, the plate (C1) of the latter being connected to a much larger plate P1. In this manner both capacity and self-induction were adjusted to suit the dynamo frequency. As regards the rise of potential through resonant action, of course, theoretically, it may amount to anything since it depends on self-induction and resistance and since these may have any value. But in practice one is limited in the selection of these values and besides these, there are other limiting causes. One may start with, say, 1,000 volts and raise the E. M. F. to 50 times that value, but one cannot start with 100,000 and raise it to ten times that value because of the losses in the media which are great, especially if the frequency is high. It should be possible to start with, for instance, two volts from a high or low frequency circuit of a dynamo and raise the E. M. F. to many hundred times that value. Thus coils of the proper dimensions might be connected each with only one of its ends to the mains from a machine of low E. M. F., and though the circuit of the machine would not be closed in the ordinary acceptance of the term, yet the machine might be burned out if a proper resonance effect would be obtained. I have not been able to produce, nor have I observed with currents from a dynamo machine, such great rises of potential. It is possible, if not probable, that with currents obtained from apparatus containing iron the disturbing influence of the latter is the cause that these theoretical possibilities cannot be realized. But if such is the case I attribute it solely to the hysteresis and Foucault current losses in the core. Generally it was necessary to transform upward, when the E. M. F. was very low, and usually an ordinary form of induction coil was employed, but sometimes the arrangement illustrated in Fig. 20 II., has been found to be convenient. In this case a coil C is made in a great many sections, a few of these being used as a primary. In this manner both primary and secondary are adjustable. One end of the coil is connected to the line L1 from the alternator, and the other line L is connected to the intermediate point of the coil. Such a coil with adjustable primary and secondary will be found also convenient in experiments with the disruptive discharge. When true resonance is obtained the top of the wave must of course be on the free end of the coil as, for instance, at the terminal of the phosphorescence bulb B. This is easily recognized by observing the potential of a point on the wire w near to the coil. In connection with resonance effects and the problem of transmission of energy over a single conductor which was previously considered, I would say a few words on a subject which constantly fills my thoughts and which concerns the welfare of all. I mean the transmission of intelligible signals or perhaps even power to any distance without the use of wires. I am becoming daily more convinced of the practicability of the scheme; and though I know full well that the great majority of scientific men will not believe that such results can be practically and immediately realized, yet I think that all consider the developments in recent years by a number of workers to have been such as to encourage thought and experiment in this direction. My conviction has grown so strong, that I no longer look upon this plan of energy or intelligence transmission as a mere theoretical possibility, but as a serious problem in electrical engineering, which must be carried out some day. The idea of transmitting intelligence without wires is the natural outcome of the most recent results of electrical investigations. Some enthusiasts have expressed their belief that telephony to any distance by induction through the air is possible. I cannot stretch my imagination se far, but I do firmly believe that it is practicable to disturb by means of powerful machines the electrostatic condition of the earth and thus transmit intelligible signals and perhaps power. In fact, what is there against the carrying out of such a scheme? We now know that electric vibration may be transmitted through a single conductor. Why then not try to avail ourselves of the earth for this purpose? We need not be frightened by the idea of distance. To the weary wanderer counting the mile-posts the earth may appear very large but to that happiest of all men, the astronomer, who gazes at the heavens and by their standard judges the magnitude of our globe, it appears very small. And so I think it must seem to the electrician, for when he considers the speed with which an electric disturbance is propagated through the earth all his ideas of distance must completely vanish. A point of great importance would be first to know what is the capacity of the earth? and what charge does it contain if electrified? Though we have no positive evidence of a charged body existing in space without other oppositely electrified bodies being near, there is a fair probability that the earth is such a body, for by whatever process it was separated from other bodies—and this is the accepted view of its origin—it must have retained a charge, as occurs in all processes of mechanical separation. If it be a charged body insulated in space its capacity should be extremely small, less than one-thousandth of a farad. But the upper strata of the air are conducting, and so, perhaps, is the medium in free space beyond the atmosphere, and these may contain an opposite charge. Then the capacity might be incomparably greater. In any case it is of the greatest importance to get an idea of what quantity of electricity the earth contains. It is difficult to say whether we shall ever acquire this necessary knowledge, but there is hope that we may, and that is, by means of electrical resonance. If ever we can ascertain at what period the earth's charge, when disturbed, oscillates with respect to an oppositely electrified system or known circuit, we shall know a fact possibly of the greatest importance to the welfare of the human race. I propose to seek for the period by means of an electrical oscillator, or a source of alternating electric currents. One of the terminals of the source would be connected to earth as, for instance, to the city water mains, the other to an insulated body of large surface. It is possible that the outer conducting air strata, or free space, contain an opposite charge and that, together with the earth, they form a condenser of very large capacity. In such case the period of vibration may be very low and an alternating dynamo machine might serve for the purpose of the experiment. I would then transform the current to a potential as high as it would be found possible and connect the ends of the high tension secondary to the ground and to the insulated body. By varying the frequency of the currents and carefully observing the potential of the insulated body and watching for the disturbance at various neighboring points of the earth's surface resonance might be detected. Should, as the majority of scientific men in all probability believe, the period be extremely small, then a dynamo machine would not do and a proper electrical oscillator would have to be produced and perhaps it might not be possible to obtain such rapid vibrations. But whether this be possible or not, and whether the earth contains a charge or not, and whatever may be its period of vibration, it certainly is possible—for of this we have daily evidence—to produce some electrical disturbance sufficiently powerful to be perceptible by suitable instruments at any point of the earth's surface. Assume that a source of alternating currents be connected, as in Fig. 21 / 185, with one of its terminals to earth (conveniently to the water mains) and with the other to a body of large surface P. When the electric oscillation is set up there will be a movement of electricity in and out of P, and alternating currents will pass through the earth, converging to, or diverging from, the point C where the ground connection is made. In this manner neighboring points on the earth's surface within a certain radius will be disturbed. But the disturbance will diminish with the distance, and the distance at which the effect will still be perceptible will depend on the quantity of electricity set in motion. Since the body P is insulated, in order to displace a considerable quantity, the potential of the source must be excessive, since there would be limitations as to the surface of P. The conditions might be adjusted so that the generator or source S will set up the same electrical movement as though its circuit were closed. Thus it is certainly practicable to impress an electric vibration at least of a certain low period upon the earth by means of proper machinery. At what distance such a vibration might be made perceptible can only be conjectured. I have on another occasion considered the question how the earth might behave to electric disturbances. There is no doubt that, since in such an experiment the electrical density at the surface could be but extremely small considering the size of the earth, the air would not act as a very disturbing factor, and there would be not much energy lost through the action of the air, which would be the case if the density were great. Theoretically, then; it could not require a great amount of energy to produce a disturbance perceptible at great distance, or even all over the surface of the globe. Now, it is quite certain that at any point within a certain radius of the source S a properly adjusted self-induction and capacity device can be set in action by resonance. But not only can this be done, but another source S1 Fig. 21, similar to S, or any number of such sources, can be set to work in synchronism with the latter, and the vibration thus intensified and spread over a large area, or a flow of electricity produced to or from the source S1 if the same be of opposite phase to the source S. I think that beyond doubt it is possible to operate electrical devices in a city through the ground or pipe system by resonance from an electrical oscillator located at a central point. But the practical solution of this problem would be of incomparably smaller benefit to man than the realization of the scheme of transmitting intelligence, or perhaps power, to any distance through the earth or environing medium. If this is at all possible, distance does not mean anything. Proper apparatus must first be produced by means of which the problem can be attacked and I have devoted much thought to this subject. I am firmly convinced that it can be done and hope that we shall live to see it done. Returning now to the light effects which it has been the chief object to investigate, it is thought proper to divide these effects into four classes: 1. Incandescence of a solid. 2. Phosphorescence. 3. Incandescence or phosphorescence of a rarefied gas; and 4. Luminosity produced in a gas at ordinary pressure. The first question is: How are these luminous effects produced? In order to answer this question as satisfactorily as I am able to do in the light of accepted views and with the experience acquired, and to add some interest to this demonstration, I shall dwell here upon a feature which I consider of great importance, inasmuch as it promises, besides, to throw a better light upon the nature of most of the phenomena produced by high-frequency electric currents. I have on other occasions pointed out the great importance of the presence of the rarefied gas, or atomic medium in general, around the conductor through which alternate currents of high frequency are passed, as regards the heating of the conductor by the currents. My experiments, described some time ago, have shown that, the higher the frequency and potential difference of the currents, the more important becomes the rarefied gas in which the conductor is immersed, as a factor of the heating. The potential difference, however, is, as I then pointed out, a more important element than the frequency. When both of these are sufficiently high, the heating may be almost entirely due to the presence of the rarefied gas. The experiments to follow will show the importance of the rarefied gas, or, generally, of gas at ordinary or other pressure as regards the incandescence or other luminous effects produced by currents of this kind. I take two ordinary 50-volt 16 C. P. lamps which are in every respect alike, with the exception, that one has been opened at the top and the air has filled the bulb, while the other is at the ordinary degree of exhaustion of commercial lamps. When I attach the lamp which is exhausted to the terminal of the secondary of the coil, which I have already used, as in experiments illustrated in Fig. 15a for instance, and turn on the current, the filament, as you have before seen, comes to high incandescence. When I attach the second lamp, which is filled with air, instead of the former, the filament still glows, but much less brightly. This experiment illustrates only in part the truth of the statements before made. The importance of the filament's being immersed in rarefied gas is plainly noticeable but not to such a degree as might be desirable. The reason is that the secondary of this coil is wound for low tension, having only 150 turns, and the potential difference at the terminals of the lamp is therefore small. Were I to take another coil with many more turns in the secondary, the effect would be increased, since it depends partially on the potential difference, as before remarked. But since the effect likewise depends on the frequency, it may be properly stated that it depends on the time rate of the variation of the potential difference. The greater this variation, the more important becomes the gas as an element of heating. I can produce a much greater rate of variation in another way, which, besides, has the advantage of doing away with the objections, which might be made in the experiment just shown, even if both the lamps were connected in series or multiple arc to the coil, namely, that in consequence of the reactions existing between the primary and secondary coil the conclusions are rendered uncertain. This result I secure by charging, from an ordinary transformer which is fed from the alternating current supply station, a battery of condensers, and discharging the latter directly through a circuit of small self-induction, as before illustrated in Figs. 19a, 19b and 19c. In Figs. 22a, 22b and 22c, the heavy copper bars BB1 are connected to the opposite coatings of a battery of condensers, or generally in such way, that the high frequency or sudden discharges are made to traverse them. I connect first an ordinary 50-volt incandescent lamp to the bars by means of the clamps C C. The discharges being; passed through the lamp, the filament is rendered incandescent, though the current through it is very small, and would not be nearly sufficient to produce a visible effect under the conditions of ordinary use of the lamp. Instead of this I now attach to the bars another lamp exactly like the first, but with the seal broken off, the bulb being therefore filled with air at ordinary pressure. When the discharges are directed through the filament, as before, it does not become incandescent. But the result might still be attributed to one of the many possible reactions. I therefore connect both the lamps in multiple arc as illustrated in Fig. 22a. Passing tile discharges through both the lamps, again the filament in the exhausted lamp l glows very brightly while that in the non-exhausted lamp l1 remains dark, as previously. But it should not be thought that the latter lamp is' taking only a small fraction of the energy supplied to both the lamps; on the contrary, it may consume a considerable portion of the energy and it may become even hotter than the one which burns brightly. In this experiment the potential difference at the terminals of the lamps varies in sign theoretically three to four million times a second. The ends of the filaments are correspondingly electrified, and the gas in the bulbs is violently agitated and a large portion of the supplied energy is thus converted into heat. In the non-exhausted bulb, there being a few million times more gas molecules than in the exhausted one, the bombardment, which is most violent at the ends of the filament, in the neck of the bulb, consumes a large portion of the energy without producing any visible effect. The reason is that, there being many molecules, the bombardment is quantitatively considerable, but the individual impacts are not very violent, as the speeds of the molecules are comparatively small owing to the small free path. In the exhausted bulb, on the contary, the speeds are very great, and the individual impacts are violent and therefore better adapted to produce a visible effect. .Besides, the convection of heat is greater in the former bulb. In both the bulbs the current traversing the filaments is very small, incomparably smaller than that which they require on an ordinary low-frequency circuit. The potential difference, however, at the ends of the filaments is very great and might be possibly 20,000 volts or more, if the filaments were straight and their ends far apart. In the ordinary lamp a spark generally occurs between the ends of the filament or between the platinum wires outside, before such a difference of potential can be reached. It might be objected that in the experiment before shown the lamps, being in multiple arc, the exhausted lamp might take a much larger current and that the effect observed might not be exactly attributable to the action of the gas in the bulbs. Such objections will lose much weight if I connect the lamps in series, with the wine result. When this is done and the discharges are directed through the filaments, it is again noted that the filament in the non-exhausted bulb l, remains dark, while that in the exhausted one (l) glows even snore intensely than under its normal conditions of working, Fig. 22b. According to general ideas the current through the filaments should now be the same, were it not modified by the presence of the gas around the filaments. At this juncture I may point out another interesting feature, which illustrates the effect of the rate of change of potential of the currents. I will leave the two lamps connected in series to the bars BB1, as in the previous experiment, Fig. 22b, but will presently reduce considerably the frequency of the currents, which was excessive in the experiment just before shown. This I may do by inserting a self-induction coil in the path of the discharges, or by augmenting the capacity of the condensers. When I now pass these low-frequency discharges through the lamps, the exhausted lamp l again is as bright as before, but it is noted also that the non-exhausted lamp l1 glows, though not quite as intensely as the other. Reducing the current through the lamps, I may bring the filament in the latter lamp to redness, and, though the filament in the exhausted lamp l is bright, Fig. 22c, the degree of its incandescence is much smaller than in Fig. 22b; when the currents were of a much higher frequency. In these experiments the gas acts in two opposite ways in determining the degree of the incandescence of the filaments, that is, by convection and bombardment. The higher the frequency and potential of the currents, the more important becomes the bomdardment. The convection on the contrary should be the smaller, the higher the frequency. When the currents are steady there is practically no bombardment, and convection may therefore with such currents also considerably modify the degree of incandescence and produce results similar to those just before shown. Thus, it two lamps exactly alike, one exhausted and one not exhausted, are connected in multiple arc or series to a direct-current machine, the filament in the non-exhausted lamp will require a considerably greater current to be rendered incandescent. This result is entirely due to convection, and the effect is the more prominent the thinner the filament. Professor Ayrton and Mr. Kilgour some time ago published quantitative results concerning the thermal emissivity by radiation and convection in which the effect with thin wires was clearly shown. This effect may be strikingly illustrated by preparing a number of small, short, glass tubes, each containing through its axis the thinnest obtainable platinum wire. If these tubes be highly exhausted, a number of them may be connected in multiple arc to a direct-current machine and all of the wires may be kept at incandescence with a smaller current than that required to render incandescent a single one of the wires if the tube be not exhausted. Could the tubes be so highly exhausted that convection would be nil, then the relative amounts of heat given off by convection and radiation could be determined without the difficulties attending thermal quantitative measurements. If a source of electric impulses of high frequency and very high potential is employed, a still greater number of the tubes may be taken and the wires rendered incandescent by a current not capable of warming perceptibly a wire of the same size immersed in air at ordinary pressure, and conveying the energy to all of them. I may here describe a result which is still more interesting, and to which I have been led by the observation of these phenomena. I noted that small differences in the density of the air produced a considerable difference in the degree of incandescence of the wires, and I thought that, since in a tube, through which a luminous discharge is passed, tile gas is generally not of uniform density, a very thin wire contained in the tube might be rendered incandescent at certain places of smaller density of the gas, while it would remain dark at the places of greater density, where the convection would be greater and the bombardment less intense. Accordingly a tube t was prepared, as illustrated in Fig. 23, which contained through the middle a very fine platinum wire w. The tube was exhausted to a moderate degree and it was found that when it was attached to the terminal of a high-frequency coil the platinum wire w, would indeed, become incandescent in patches, as illustrated in Fig. 23. Later a number of these tubes with one or more wires were prepared, each showing this result. The effect was best noted when the striated discharge occurred in the tube, but was also produced when the striae were not visible, showing that, even then, the gas in the tube was, not or uniform density. The position of the striae was generally such, that the rarefactions corresponded to the places of incandescence or greater brightness on the wire w. But in a few instances it was noted, that the bright spots on the wire were covered by the dense parts of the striated discharge as indicated by l in Fig. 23, though the effect was barely perceptible. This was explained in a plausible way by assuming that the convection was not widely different in the dense and rarefied places, and that the bombardment was greater on the dense places of the striated discharge. It is, in fact, often observed in bulbs, that under certain conditions a thin wire is brought to higher incandescence when the air is not too highly rarefied. This is the case when the potential of the coil is not high enough for the vacuum, but the result may be attributed to many different causes. In all cases this curious phenomenon of incandescence disappears when the tube, or rather the wire, acquires throughout a uniform temperature. Disregarding now the modifying effect of convection there are then two distinct causes which determine the incandescence of a wire or filament with varying currents, that is, conduction current and bombardment. With steady currents we have to deal only with the former of these two causes, and the heating effect is a minimum, since the resistance is least to steady flow. When the current is a varying one the resistance is greater, and hence the heating effect is increased. Thus if the rate of change of the current is very great, the resistance may increase to such an extent that the filament is brought to incandescence with inappreciable currents, and we are able to take a short and thick block of carbon or other material and brim, it to bright incandescence with a current incomparably smaller than that required to bring to the same deuce of incandescence an ordinary thin lamp filament with a steady or low frequency current. This result is important, and illustrates how rapidly our views on these subjects are changing, and how quickly our field of knowledge is extending. In the art of incandescent lighting, to view this result in one aspect only, it has been commonly considered as an essential requirement for practical success, that the lamp filament should be thin and of high resistance. But now we know that the resistance of the filament to the steady flow does not mean anything; the filament might as well be short and thick; for if it be immersed in rarefied gas it will become incandescent by the passage of a small current. It all depends on the frequency and potential of the currents. We may conclude from this, that it would be of advantage, so far as the lamp is considered, to employ high frequencies for lighting, as they allow the use of short and thick filaments and smaller currents. If a wire or filament be immersed in a homogeneous medium, all the heating is due to true conduction current, but if it be enclosed in an exhausted vessel the conditions are entirely different. Here the gas begins to act and the heating effect of the conduction current, as is shown in many experiments, may be very small compared with that of the bombardment. This is especially the case if the circuit is not closed and the potentials are of course very high. Suppose that a fine filament enclosed in an exhausted vessel be connected with one of its ends to the terminal of a high tension coil and with its other end to a large insulated plate. Though the circuit is not closed, the filament, as I have before shown, is brought to incandescence. If the frequency and potential be comparatively low, the filament is heated by the current passing through it. If the frequency and potential, and principally the latter, be increased, the insulated plate need be but very small, or may be done away with entirely; still: the filament will become incandescent, practically all the heating being then due to the bombardment. A practical way of combining both the effects of conduction currents and bombardment is Illustrated in Fig. 24, in which an ordinary lamp is shown provided with a very thin filament which has one of the ends of the latter connected to a shade serving the purpose of the insulated plate, and the other end to the terminal of a high tension source. It should not be thought that only rarefied gas is an important factor in the heating of a conductor by varying currents, but gas at ordinary pressure may become important, if the potential difference and frequency of the currents is excessive. On this subject I have already stated, that when a conductor is fused by a stroke of lightning, the current through it may be exceedingly small, not even sufficient to heat the conductor perceptibly, were. the latter immersed in a homogeneous medium. From the preceding it is clear that when a conductor of high resistance is connected to the terminals of a source of high frequency currents of high potential, there may occur considerable dissipation of energy, principally at the ends of the conductor, in consequence of the action of the gas surrounding the conductor. Owing to this, the current through a section of the conductor at a point midway between its ends may be much smaller than through a section near the ends. Furthermore, the current passes principally through the outer portions of the conductor, but this effect is to be distinguished from the skin effect as ordinarily interpreted, for the latter would, or should, occur also in a continuous incompressible medium. If a great many incandescent lamps are connected in series to a source of such currents, the lamps at the ends may burn brightly, whereas those in the middle may remain entirely dark. This is due principally to bombardment, as before stated. But even if the currents be steady, provided the difference of potential is very great, the lamps at the end will burn more brightly than those in the middle. In such case there is no rhythmical bombardment, and the result is produced entirely by leakage. This leakage or dissipation into space when the tension is high, is considerable when incandescent lamps are used, and still more considerable with arcs, for the latter act like flames. Generally, of course, the dissipation is much smaller with steady, than with varying, currents. I have contrived an experiment which illustrates in an interesting manner the effect of lateral diffusion. If a very long tube is attached to the terminal of a high frequency coil, the luminosity is greatest near the terminal and falls off gradually towards the remote end. This is more marked if the tube is narrow. A small tube about one-half inch in diameter and twelve inches long (Fig. 25), has one of its ends drawn out into a fine fibre f nearly three feet long. The tube is placed in a brass socket T which can be screwed on the terminal T1 of the induction coil. The discharge passing through the tube first illuminates the bottom of the same, which is of comparatively large section; but through the long glass fibre the discharge cannot pass. But gradually the rarefied gas inside becomes warmed and more conducting and the discharge spreads into the glass fibre. This spreading is so slow, that it may take half a minute or more until the discharge has worked through up to the top of the glass fibre, then presenting the appearance of a strongly luminous thin thread. By adjusting the potential at the terminal the light may be made to travel upwards at any speed. Once, however, the glass fibre is heated, the discharge breaks through its entire length instantly. The interesting point to be noted is that, the higher the frequency of the currents, or in other words, the greater relatively the lateral dissipation, at a slower rate may the light be made to propagate through the fibre. This experiment is best performed with a highly exhausted and freshly made tube. When the tube has been used for some time the experiment often fails. It is possible that the gradual and slow impairment of the vacuum is the cause. This slow propagation of the discharge through a very narrow glass tube corresponds exactly to the propagation of heat through a bar warmed at one end. The quicker the heat is carried away laterally the longer time it will take for the heat to warm the remote end. When the current of a low frequency coil is passed through the fibre from end to end, then the lateral dissipation is small and the discharge instantly breaks through almost without exception. After these experiments and observations which have shown the importance of the discontinuity or atomic structure of the medium and which will serve to explain, in a measure at least, the nature of the four kinds of light effects producible with these currents, I may now give you an illustration of these effects. For the sake of interest I may do this in a manner which to many of you might be novel. You have seen: before that we may now convey the electric vibration to a body by means of a single wire or conductor of any hind. Since the human frame is conducting I may convey the vibration through my body. First, as in some previous experiments, I connect my body with one of the terminals of a high-tension transformer and take in my hand an exhausted bulb which contains a small carbon button mounted upon a platinum wire leading to the outside of the bulb, and the button is rendered incandescent as soon as the transformer is set to work (Fig. 26). I may place a conducting shade on the bulb which serves to intensify the action, but it is not necessary. Nor is it required that the button should be in conducting connection with the hand through a wire leading through the glass, for sufficient energy may be transmitted through the glass itself by inductive action to render the button incandescent. Next I take a highly exhausted bulb containing a strongly phosphorescent body, above which is mounted a small plate of aluminum on a platinum wire leading to the outside, and the currents flowing through my body excite intense phosphorescence in the bulb (Fig. 27). Next again I take in my hand a simple exhausted tube, and in the same manner the gas inside the tube is rendered highly incandescent or phosphorescent (Fig. 28). Finally, I may take in my hand a wire, bare or covered with thick insulation, it is quite immaterial; the electrical vibration is so intense as to cover the wire with a luminous film (Fig. 29). A few words must now be devoted to each of these phenomena. In the first place, I will consider the incandescence of a button or of a solid in general, and dwell upon some facts which apply equally to all these phenomena. It was pointed out before that when a thin conductor, such as a lamp filament, for instance, is connected with one of its ends to the terminal of a transformer of high tension the filament is brought to incandescence partly by a conduction current and partly by bombardment. The shorter and thicker the filament the more important becomes the latter, and finally, reducing the filament to a mere button, all the heating must practically be attributed to the bombardment. So in the experiment before shown, the button is rendered incandescent by the rhythmical impact of freely movable small bodies in the bulb. These bodies may be the molecules of the residual gas, particles of dust or lumps torn from the electrode; whatever they are, it is certain that the heating of the button is essentially connected with the pressure of such freely movable particles, or of atomic matter in general in the bulb. The heating is the more intense the greater the number of impacts per second and the greater the energy of each impact. Yet the button would be heated also if it were connected to a source of a steady potential. In such a case electricity mould be carried away from the button by the freely movable carriers or particles flying about, and the quantity of electricity thus carried away might be sufficient to bring the button to incandescence by its passage through the latter. But the bombardment could not be of great importance in such case. For this reason it would require a comparatively very great supply of energy to the button to maintain it at incandescence with a steady potential. The higher the frequency of the electric impulses the more economically can the button be maintained at incandescence. One of the chief reasons why this is so, is, I believe, that with impulses of very high frequency there is less exchange of the freely movable carriers around the electrode and this means, that in the bulb the heated matter is better confined to the neighborhood of the button. If a double bulb, as illustrated in Fig. 30 be made, comprising a large globe B and a small one b, each containing as usual a filament f mounted on a platinum wire w and w1 it is found, that if the filaments f f be exactly alike, it requires less energy to keep the filament in the globe b at a certain degree of incandescence, than that in the globe B. This is due to the confinement of the movable particles around the button. In this case it is also ascertained, that the filament in the small globe b is less deteriorated when maintained a certain length of time at incandescence. This is a necessary consequence of the fact that the gas in the small bulb becomes strongly heated and therefore a very good conductor, and less work is then performed on the button, since the bombardment becomes less intense as the conductivity of the gas increases. In this construction, of course, the small bulb becomes very hot and when it reaches an elevated temperature the convection and radiation on the outside increase. On another occasion I have shown bulbs in which this drawback was largely avoided. In these instances a very small bulb, containing a refractory button, was mounted in a large globe and the space between the walls of both was highly exhausted. The outer large globe remained comparatively cool in such constructions, When the large globe was on the pump and the vacuum between the walls maintained permanent by the continuous action of the pump, the outer globe would remain quite cold, while the button in tile small bulb was kept at incandescence. But when the seal was made, and the button in the small bulb maintained incandescent some length of time, the large globe too would become warmed. Prom this I conjecture that if vacuous space (as Prof. Dewar finds) cannot convey heat, it is so merely in virtue of our rapid motion through space or, generally speaking, by the motion of the medium relatively to us, for a permanent condition could not be maintained without the medium being constantly renewed. A vacuum cannot, according to all evidence, be permanently maintained around a hot body. In these constructions, before mentioned, the small bulb inside would, at least in the first stages, prevent all bombardment against the outer large globe. It occurred to me then to ascertain how a metal sieve would behave in this respect, and several bulbs, as illustrated in Fig. 31, were prepared for this purpose. In a globe b, was mounted a thin filament f (or button) upon a platinum wire w passing through a glass stem and leading to the outside of the globe. The filament f was surrounded by a metal sieve s. It was found in experiments with such bulbs that a sieve with wide meshes apparently did not in the slightest affect the bombardment against the globe b. When the vacuum was high, the shadow of the sieve was clearly projected against the globe and the latter would get hot in a short while. In some bulbs the sieve ,v was connected to a platinum wire sealed in the glass. When this wire was connected to the other terminal of the induction coil (the E. M. F. being kept low in this case), or to an insulated plate, the bombardment against the outer globe b was diminished. By taking a sieve with fine meshes the bombardment against the globe b was always diminished, but even then if the exhaustion was carried very far, and when the potential of the transformer was very high, the globe b would be bombarded and heated quickly, though no shadow of the sieve was visible, owing to the smallness of the meshes. But a glass tube or other continuous body mounted so as to surround the filament, did entirely cut off the bombardment and for a while the outer globe b would remain perfectly cold. Of course when the glass tube was sufficiently heated the bombardment against the outer globe could be noted at once. The experiments with these bulbs seemed to show that the speeds of the projected molecules or particles must be considerable (though quite insignificant when compared with that of light), otherwise it would be difficult to understand how they could traverse a fine metal sieve without being affected, unless it were found that such small particles or atoms cannot be acted upon directly at measurable distances. In regard to the speed of the projected atoms, Lord Kelvin has recently estimated it at about one kilometre a second or thereabouts in an ordinary Crookes bulb. As the potentials obtainable with a disruptive discharge coil are much higher than with ordinary coils, the speeds must, of course, be much greater when the bulbs are lighted from such a coil. Assuming the speed to be as high as five kilometres and uniform through the whole trajectory, as it should be in a very highly exhausted vessel, then if the alternate electrifications of the electrode would be of a frequency of five million, the greatest distance a particle could get away from the electrode would be one millimetre, and if it could be acted upon directly at that distance, the exchange of electrode matter or of the atoms would be very slow and there would be practically no bombardment against the bulb. This at least should be so, if the action of an electrode upon the atoms of the residual gas would be such as upon electrified bodies which we can perceive. A hot body enclosed in a n exhausted bulb produces always atomic bombardment, but a hot body has no definite rhythm, for its molecules perform vibrations of all kinds. If a bulb containing a button or filament be exhausted as high as is possible with tile greatest care and by the use of the best artifices, it is often observed that the discharge cannot, at first, break through, but after some time, probably in consequence of some changes within the bulb, the discharge finally passes through and the button is rendered incandescent. In fact, it appears that the higher the degree of exhaustion the easier is the incandescence produced. There seem to be no other causes to which the incandescence might be attributed in such case except to the bombardment or similar action of the residual gas, or of particles of matter in general. But if the bulb be exhausted with the greatest care can these play an important part? Assume the vacuum in the bulb to be tolerably perfect, the great interest then centres in the question: Is the medium which pervades all space continuous or atomic? If atomic, then the heating of a conducting button or filament in an exhausted vessel might be due largely to ether bombardment, and then the heating of a conductor in general through which currents of high frequency or high potential are passed must be modified by the behavior of such medium; then also the skin effect, the apparent increase of the ohmic resistance, etc., admit, partially at least, of a different explanation. It is certainly more in accordance with many phenomena observed with high frequency currents to hold that all space is pervaded with free atoms, rather than to assume that it is devoid of these, and dark and cold, for so it must be, if filled with a continuous medium, since in such there can be neither heat nor light. Is then energy transmitted by independent carriers or by the vibration of a continuous medium? This important question is by no means as yet positively answered. But most of the effects which are here considered, especially the light effects, incandescence, or phosphorescence, involve the presence of free atoms and would be impossible without these. In regard to the incandescence of a refractory button (or filament) in an exhausted receiver, which has been one of the subjects of this investigation, the chief experiences, which may serve as a guide in constructing such bulbs, may be summed up as follows: 1. The button should be as small as possible, spherical, of a smooth or polished surface, and of refractory material which withstands evaporation best. 2. The support of the button should be very thin and screened by an aluminum and mica sheet, as I have described on another occasion. 3. The exhaustion of the bulb should be as high as possible. 4. The frequency of the currents should be as high as practicable. 5. The currents should be of a harmonic rise and fall, without sudden interruptions. 6. The heat should be confined to the button by inclosing the same in a small bulb or otherwise. 7. The space between the walls of the small bulb and the outer globe should be highly exhausted. Most of the considerations which apply to the incandescence of a solid just considered may likewise be applied to phosphorescence. Indeed, in an exhausted vessel the phosphorescence is, as a rule, primarily excited by the powerful beating of the electrode stream of atoms against the phosphorescent body. Even in many cases, where there is no evidence of such a bombardment, I think that phosphorescence is excited by violent impacts of atoms, which are not necessarily thrown off from the electrode but are acted upon from the same inductively through the medium or through chains of other atoms. That mechanical shocks play an important part in exciting phosphorescence in a bulb may be seen from the following experiment. If a bulb, constructed as that illustrated in Fig. 10, be taken and exhausted with the greatest care so that the discharge cannot pass, the filament facts by electrostatic induction upon the tube t and the latter is set in vibration. If the tube o be rather wide, about an inch or so, the filament may be so powerfully vibrated that whenever it hits the glass tube it excites phosphorescence. But the phosphorescence ceases when the filament comes to rest. The vibration can be arrested and again started by varying the frequency of the currents. Now the filament has its own period of vibration, and if the frequency of the currents is such that there is resonance, it is easily set vibrating, though the potential of the currents be small. I have often observed that the filament in the bulb is destroyed by such mechanical resonance. The filament vibrates as a rule so rapidly that it cannot be seen and the experimenter may at first be mystified. When such an experiment as the one described is carefully performed, the potential of the currents need be extremely small, and for this reason I infer that the phosphorescence is then due to the mechanical shock of the filament against the glass, just as it is produced by striking a loaf of sugar with a knife. The mechanical shock produced by the projected atoms is easily noted when a bulb containing a button is grasped in the hand and the current turned on suddenly. I believe that a bulb could be shattered by observing the conditions of resonance. In the experiment before cited it is, of course, open to say, that the glass tube, upon coming in contact with the filament, retains a charge of a certain sign upon the point of contact. If now the filament main touches the glass at the same point while it is oppositely charged, the charges equalize under evolution of light. But nothing of importance would be gained by such an explanation. It is unquestionable that the initial charges given to the atoms or to the glass play some part in exciting phosphorescence. So for instance, if a phosphorescent bulb be first excited by a high frequency coil by connecting it to one of the terminals of the latter and the degree of luminosity be noted and then the bulb be highly charged from a Holtz machine by attaching it preferably to the positive terminal of the machine, it is found that when the bulb is again connected to the terminal of the high frequency coil, the phosphorescence is far more intense. On another occasion I have considered the possibility of some phosphorescent phenomena in bulbs being produced by the incandescence of an infinitesimal layer on the surface of the phosphorescent body. Certainly the impact of the atoms is powerful enough to produce intense incandescence by the collisions, since they bring quickly to a high temperature a body of considerable bulk. If any such effect exists, then the best appliance for producing phosphorescence in a bulb, which we know so far, is a disruptive discharge coil giving an enormous potential with but few fundamental discharges, say 25-30 per second, just enough to produce a continuous impression upon the eye. It is a fact that such a coil excites phosphorescence under almost any condition and at all degrees of exhaustion, and I have observed effect; which appear to be due to phosphorescence even at ordinary pressures of the atmosphere, when the potentials are extremely high. But if phosphorescent light is produced by the equalization of charges of electrified atoms (whatever this may mean ultimately), then the higher the frequency of the impulses or alternate electrifications, the more economical will be the light production. It is a long known and noteworthy fact that all the phosphorescent bodies are poor conductors of electricity and heat, and that all bodies cease to emit phosphorescent light when they are brought to a certain temperature. Conductors on the contrary do not possess this quality. There are but few exceptions to the rule. Carbon is one of them. Becquerel noted that carbon phosphoresces at a certain elevated temperature preceding the dark red. This phenomenon may be easily observed in bulbs provided with a rather large carbon electrode (say, a sphere of six millimetres diameter). If the current is turned on after a few seconds, a snow white film covers the electrode, just before it bets dark red. Similar effects are noted with other conducting bodies, but many scientific men will probably not attribute them to true phosphorescence. Whether true incandescence has anything to do with phosphorescence excited by atomic impact or mechanical shocks still remains to be decided, but it is a fact that all conditions, which tend to localize and increase the heating effect at the point of impact, are almost invariably the most favorable for the production of phosphorescence. So, if the electrode be very small, which is equivalent to saying in general, that the electric density is great; if the potential be high, and if the gas be highly rarefied, all of which things imply high speed of the projected atoms, or matter, and consequently violent impacts—the phosphorescence is very intense. If a bulb provided with a large and small electrode be attached to the terminal of an induction coil, the small electrode excites phosphorescence while the large one may not do so, because of the smaller electric density and hence smaller speed of the atoms. 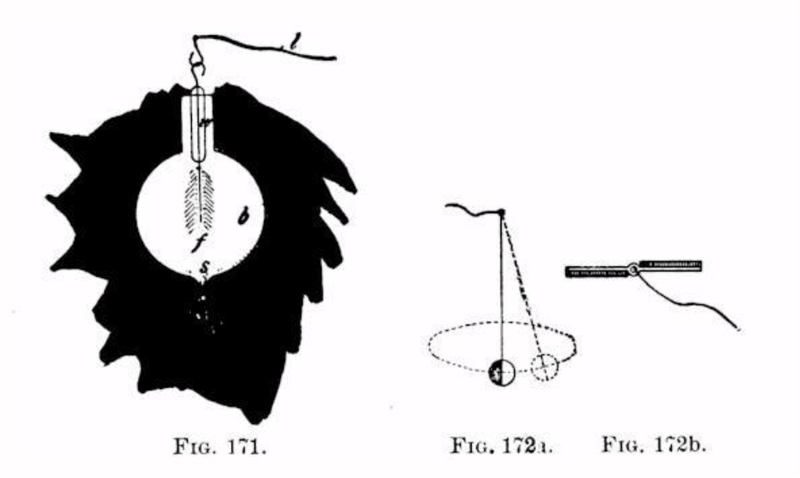 A bulb provided with a large electrode may be grasped with the hand while the electrode is connected to the terminal of the coil and it may not phosphoresce; but if instead of grasping the bulb with the hand, the same be touched with a pointed wire, the phosphorescence at once spreads through the bulb, because of the great density at the point of contact. With low frequencies it seems that gases of great atomic weight excite more intense phosphorescence than those of smaller weight, as for instance, hydrogen. With high frequencies the observations are not sufficiently reliable to draw a conclusion. Oxygen, as is well-known, produces exceptionally strong effects, which may be in part due to chemical action. A bulb with hydrogen residue seems to be most easily excited. Electrodes which are most easily deteriorated produce more intense phosphorescence in bulbs, but the condition is not permanent because of the impairment of the vacuum and the deposition of the electrode matter upon the phosphorescent surfaces. Some liquids, as oils, for instance, produce magnificent effects of phosphorescence (or fluorescence? ), but they last only a few seconds. So if a bulb has a trace of oil on the walls and the current is turned on, the phosphorescence only persists for a few moments until the oil is carried away. Of all bodies so far tried, sulphide of zinc seems to be the most susceptible to phosphorescence. Some samples, obtained through the kindness of Prof. Henry in Paris, were employed in many of these bulbs. One of the defects of this sulphide is, that it loses its quality of emitting light when brought to a temperature which is by no means high. It can therefore, be used only for feeble intensities. An observation which might deserve notice is, that when violently bombarded from an aluminum electrode it assumes a black color, but singularly enough, it returns to the original condition when it cools down. The most important fact arrived at in pursuing investigations in this direction is, that in all cases it is necessary, in order to excite phosphorescence with a minimum amount of energy, to observe certain conditions. Namely, there is always, no matter what the frequency of the currents, degree of exhaustion and character of the bodies in the bulb, a certain potential (assuming the bulb excited from one terminal) or potential difference (assuming the bulb to be excited with both terminals) which produces the most economical result. If the potential be increased, considerable energy may be wasted without producing any more light, and if it be diminished, then again the light production is not as economical. The exact condition under which the best result is obtained seems to depend on many things of a different nature, and it is to be yet investigated by other experimenters, but it will certainly have to be observed when such phosphorescent bulbs are operated, if the best results are to be obtained. Coming now to the most interesting of these phenomena, the incandescence or phosphorescence of gases, at low pressures or at the ordinary pressure of the atmosphere, we must seek the explanation of these phenomena in the same primary causes, that is, in shocks or impacts of the atoms. Just as molecules or atoms beating upon a solid body excite phosphorescence in the same or render it incandescent, so when colliding among themselves they produce similar phenomena. But this is a very insufficient explanation and concerns only the crude mechanism. Light is produced by vibrations which go on at a rate almost inconceivable. If we compute, from the energy contained in the form of known radiations in a definite space the force which is necessary to set up such rapid vibrations, we find, that though the density of the ether be incomparably smaller than that of any body we know, even hydrogen, the force is something surpassing comprehension. What is this force, which in mechanical measure may amount to thousands of tons per square inch? It is electrostatic force in the light of modern views. It is impossible to conceive how a body of measurable dimensions could be charged to so high a potential that the force would be sufficient to produce these vibrations. Long before any such charge could be imparted to the body it would be shattered into atoms. The sun emits light and heat, and so does an ordinary flame or incandescent filament, but in neither of these can the force be accounted for if it be assumed that it is associated with the body as a whole. Only in one way may we account for it, namely, by identifying it with the atom. An atom is so small, that if it be charged by coming in contact with an electrified body and the charge be assumed to follow the same law as in the case of bodies of measurable dimensions, it must retain a quantity of electricity which is fully capable of accounting for these forces and tremendous rates of vibration. But the atom behaves singularly in this respect—it always takes the same "charge". It is very likely that resonant vibration plays a most important part in all manifestations of energy in nature. Throughout space all matter is vibrating, and all rates of vibration are represented, from the lowest musical note to the highest pitch of the chemical rays, hence an atom, or complex of atoms, no matter what its period, must find a vibration with which it is in resonance. When we consider the enormous rapidity of the light vibrations, we realize the impossibility of producing such vibrations directly with any apparatus of measurable dimensions, and we are driven to the only possible means of attaining the object of setting up waves of light by electrical means and economically, that is, to affect the molecules or atoms of a gas, to cause them to collide and vibrate. We then must ask ourselves—How can free molecules or atoms be affected? It is a fact that they can be affected by electrostatic force, as is apparent in many of these experiments. By varying the electrostatic force we can agitate the atoms, and cause them to collide accompanied by evolution of heat and light. It is not demonstrated beyond doubt that vie can affect them otherwise. If a luminous discharge is produced in a closed exhausted tube, do the atoms arrange themselves in obedience to any other but to electrostatic force acting in straight lines from atom to atom? Only recently I investigated the mutual action between two circuits with extreme rates of vibration. When a battery of a few jars (c c c c, Fig. 32), is discharged through a primary P of low resistance (the connections being as illustrated in Figs. 19a, 19b and 19c), and the frequency of vibration is many millions there are great differences of potential between points on the primary not more than a few inches apart. These differences may be 10,000 volts per inch, if not more, taking the maximum value of the E. M. F. The secondary S is therefore acted upon by electrostatic induction, which is in such extreme cases of much greater importance than the electro-dynamic. To such sudden impulses the primary as well as the secondary are poor conductors, and therefore great differences of potential may be produced by electrostatic induction between adjacent points on the secondary. Then sparks may jump between the wires and streamers become visible in the dark if the light of the discharge through the spark gap d d be carefully excluded. If now we substitute a closed vacuum tube for the metallic secondary S, the differences of potential produced in the tube by electrostatic induction from the primary are fully sufficient to excite portions of it; but as the points of certain differences of potential on the primary are not fixed, but are generally constantly changing in position, a luminous band is produced in the tube, apparently not touching the glass, as it should, if the points of maximum and minimum differences of potential were fixed on the primary. I do not exclude the possibility of such a tube being excited only by electro-dynamic induction, for very able physicists hold this view; but in my opinions, there is as yet no positive proof given that atoms of a gas in a closed tube may arrange themselves in chains under the action of an: electromotive impulse produced by electro-dynamic induction in the tube. I have been unable so far to produce striae in a tube, however long, and at whatever degree of exhaustion, that is, striae at right angles to the supposed direction of the discharge or the axis of the tube; but I have distinctly observed in a large bulb, in which a wide luminous band was produced by passing a discharge of a battery through a wire surrounding the bulb, a circle of feeble luminosity between two luminous bands, one of which was more intense than the other. Furthermore, with my present experience I do not think that such a gas discharge in a closed tube can vibrate, that is, vibrate as a whole. I am convinced that no discharge through a gas can vibrate. The atoms of a gas behave very curiously in respect to sudden electric impulses. The gas does not seem to possess any appreciable inertia to such impulses, for it is a fact, that the higher the frequency of the impulses, with the greater freedom does the discharge pass through the gas. If the gas possesses no inertia then it cannot vibrate, for some inertia is necessary for the free vibration. I conclude from this that if a lightning discharge occurs between two clouds, there can be no oscillation, such as would be expected, considering the capacity of the clouds. But if the lightning discharge strike the earth, there is always vibration—in the earth, but not in the cloud. In a gas discharge each atom vibrates at its oven rate, but there is no vibration of the conducting gaseous mass as a whole. This is an important consideration in the great problem of producing light economically, for it teaches us that to reach this result we must use impulses of very high frequency and necessarily also of high potential. It is a fact that oxygen produces a more intense light in a tube. Is it because oxygen atoms possess some inertia and the vibration does not die out instantly? But then nitrogen should be as good, and chlorine and vapors of many other bodies much better than oxygen, unless the magnetic properties of the latter enter prominently into play. Or, is the process in the tube of an electrolytic nature? Many observations certainly speak for it, the most important being that matter is always carried away from the electrodes and the vacuum in a bulb cannot be permanently maintained. If such process takes place in reality, then again must we take refuge in high frequencies, for, with such, electrolytic action should be reduced to a minimum, if not rendered entirely impossible. It is an undeniable fact that with very high frequencies, provided the impulses be of harmonic nature, like those obtained from an alternator, there is less deterioration and the vacua are more permanent. With disruptive discharge coils there are sudden rises of potential and the vacua are more quickly impaired, for the electrodes are deteriorated in a very short time. It was observed in some large tubes, which were provided with heavy carbon blocks B B1, connected to platinum wires w w1 (as illustrated in Fig. 33), and which were employed in experiments with the disruptive discharge instead of the ordinary air gap, that the carbon particles under the action of the powerful magnetic field in which the tube was placed, were deposited in regular fine lines in the middle of the tube, as illustrated. These lines were attributed to the deflection or distortion of the discharge by the magnetic field, but why the deposit occurred principally where the field was most intense did not appear quite clear. A fact of interest, likewise noted, was that the presence of a strong magnetic field increases the deterioration of the electrodes, probably by reason of the rapid interruptions it produces, whereby there is actually a higher E. M. F. maintained between the electrodes. Much would remain to be said about the luminous effects produced in gases at low or ordinary pressures. With the present experiences before us we cannot say that the essential nature of these charming phenomena is sufficiently known. But investigations in this direction are being pushed with exceptional ardor. Every line of scientific pursuit has its fascinations, but electrical investigation appears to possess a peculiar attraction, for there is no experiment or observation of any kind in the domain of this wonderful science which would not forcibly appeal to us. Yet to me it seems, that of all the many marvelous things we observe, a vacuum tube, excited by an electric impulse from a distant source, bursting forth out of the darkness and illuminating the room with its beautiful light, is as lovely a phenomenon as can greet our eyes. More interesting still it appears when, reducing the fundamental discharges across the gap to a very small number and waving the tube about we produce all kinds of designs in luminous lines. So by way of amusement I take a straight long tube, or a square one, or a square attached to a straight tube, and by whirling them about in the hand, I imitate the spokes of a wheel, a Gramme winding, a drum winding, an alternate current motor winding, etc. ( Fig. 34). Viewed from a distance the effect is weak and much of its beauty is lost, but being near or holding the tube in the hand, one cannot resist its charm. In presenting these insignificant results I have not attempted to arrange and coordinate them, as would be proper in a strictly scientific investigation, in which every succeeding result should be a logical sequence of the preceding, so that it might be guessed in advance by the careful reader or attentive listener. I have preferred to concentrate my energies chiefly upon advancing novel facts or ideas which might serve as suggestions to others, and this may serve as an excuse for the lack of harmony. The explanations of the phenomena have been given in good faith and in the spirit of a student prepared to find that they admit of a better interpretation. There can be no great harm in a student taking an erroneous view, but when great minds err, the world must dearly pay for their mistakes. Fig. 18 is missing. The disruptive discharge motor schematic. It is possible that many pictures are missing in this lecture. I'll have to search for the missing pictures. Thankyou to comment about it!